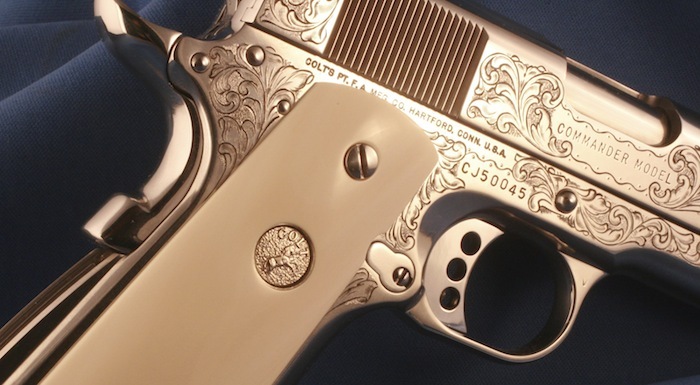 AND ENGRAVED COLT FIREARMS AVAILABLE ANYWHERE! 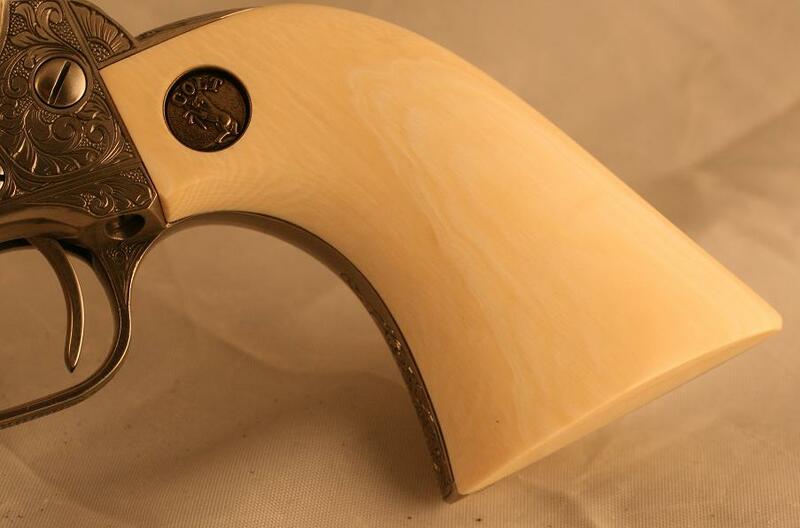 We want to make all of our customers aware that we are using giraffe bone, rams horn, walnut, as well other natural materials to handcraft our grips with great success on many of our recent projects. 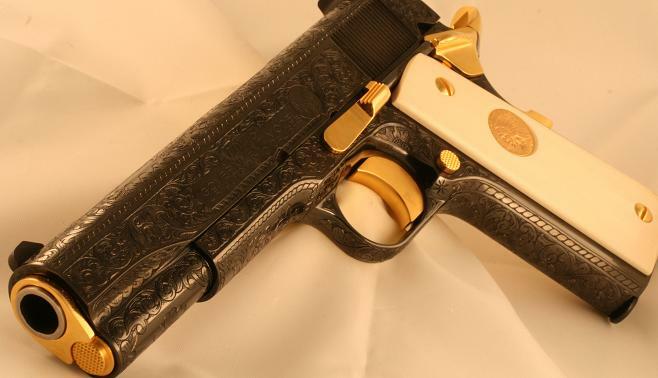 Our grips recently used on guns for The Colt Custom Gun Shop, The Colt Collectors Association, and also on Nighthawk Custom's top of the line VIP 1911. We have a gallery of pictures added to our grip page (click on grips tab on left), that we will be continuously adding to showcase our grip work. These are just a few examples. Please call 860-872-7373 or email nmsprts@aol.com with any questions, or to place your order we would love to talk with you. The dedicated employees at Nutmeg Sports LLC have created yet another Colt masterpiece for the distinguished collector. 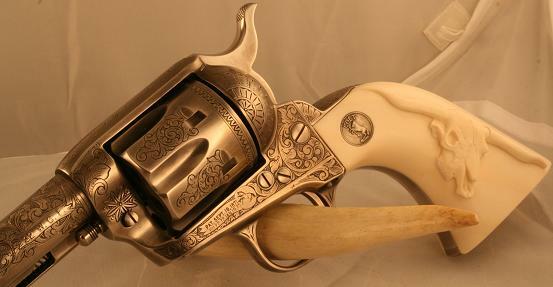 It is a Colt Single Action Army revolver, serial number S74447A. A 4 3/4" .45. 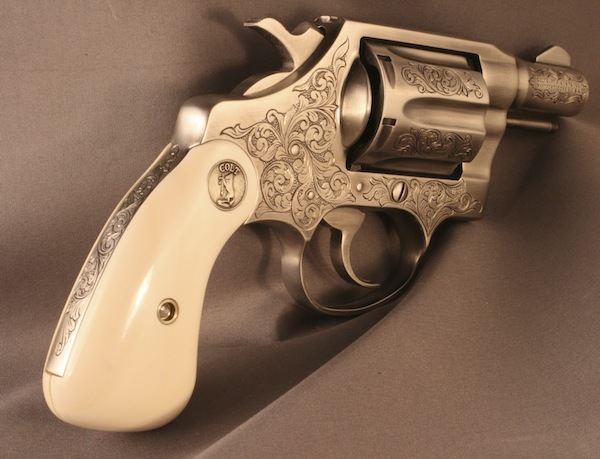 It is brand new, unfired and in it's original Colt packaging. During our reassembly we had our Master gunsmith apply one or our trademark custom tuned action jobs. Now the cocking function operates as it were on smooth ball bearings but the lock up is as tight as a drum. 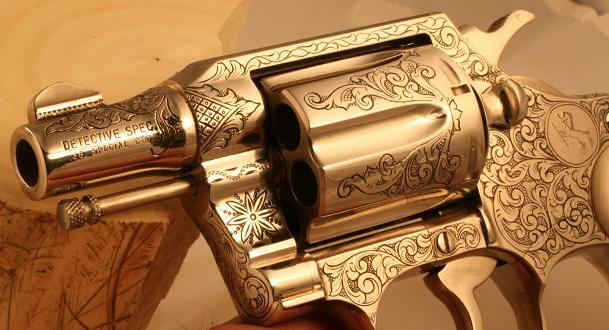 This gun has been expertly engraved in a "Cattle Brand" theme. 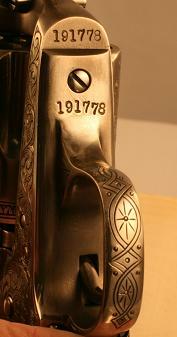 The hammer and front sight have been engraved, and even the panel screws have not escaped the engravers chisel. This SAA has been finished in our antique nickel. It is our most durable and popular finish. 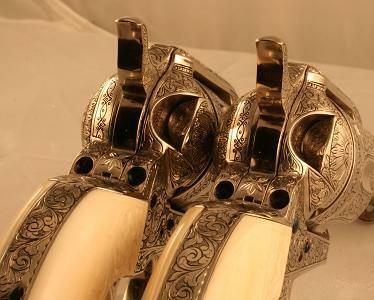 The grips are pre-ban genuine African elephant ivory showing very fine grain and character that matches from side to side. We are also including this beautiful locking walnut case, that has the serpentine Colt logo in the lid. The interior is a French fit black velvet which shows off the finish and engraving magnificently. 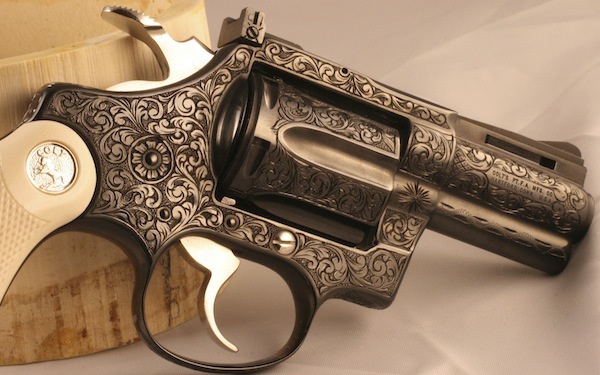 This Colt will fit well into the finest of any collections. Just finished these special orders... Do you have a project in mind? 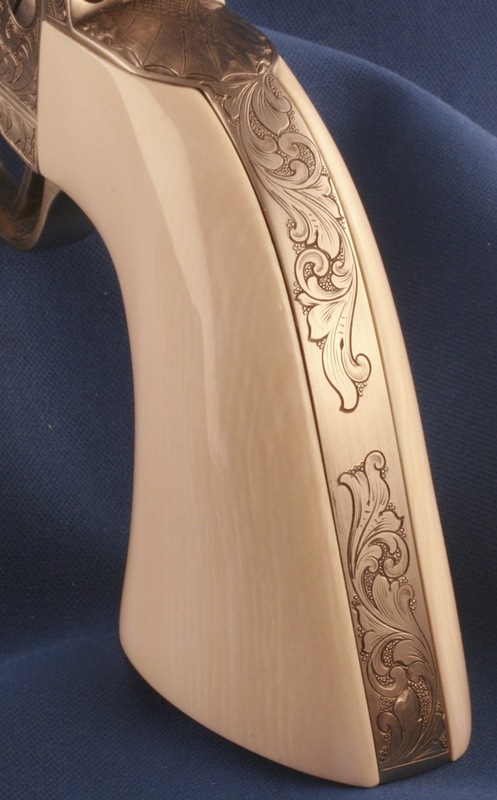 We have a beautifully engraved 7 1/2" USFA for sale. Color case frame, finished in bright nickel with ink and bake engraving. 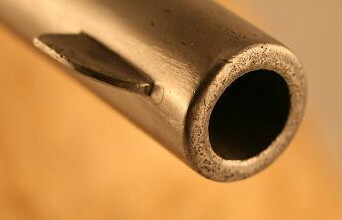 This is a 44-40 Black Powder frame, with Bullseye Ejector Rod Head. This has a very significant and historical serial number #38704. 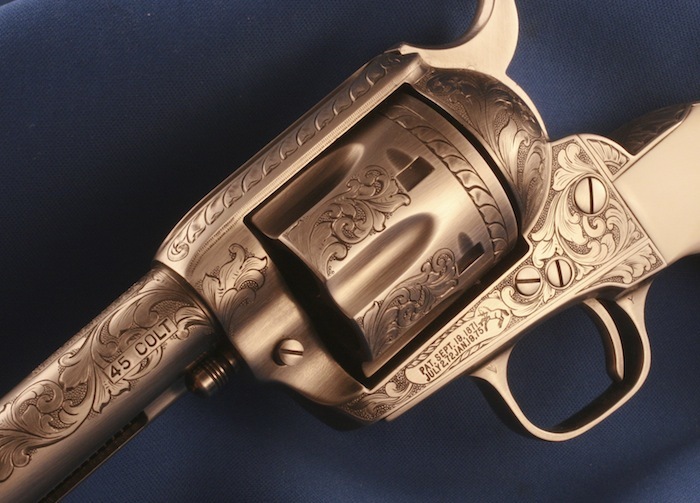 This is the same serial number as the 1st Colt 44-40 that left the Colt Factory in 1878. 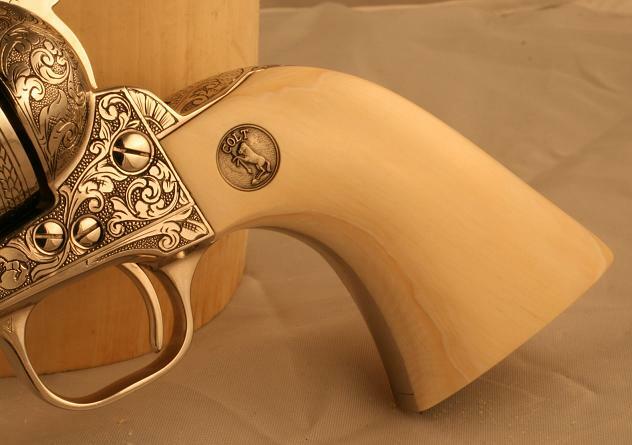 This gun has been beautifully engraved by Peter Rhodes of Connecticut and fit with Walnut Grips. This is a one of a kind SAA. Just had to show off this amazing Bisley transformation. Do you have a tired gal that's been ridden hard and put away wet? Send her in and let Nutmeg Sports work our magic on it. We have a Colt 1911 and matching knife for sale. It is a series 80 serial#SS17555E. 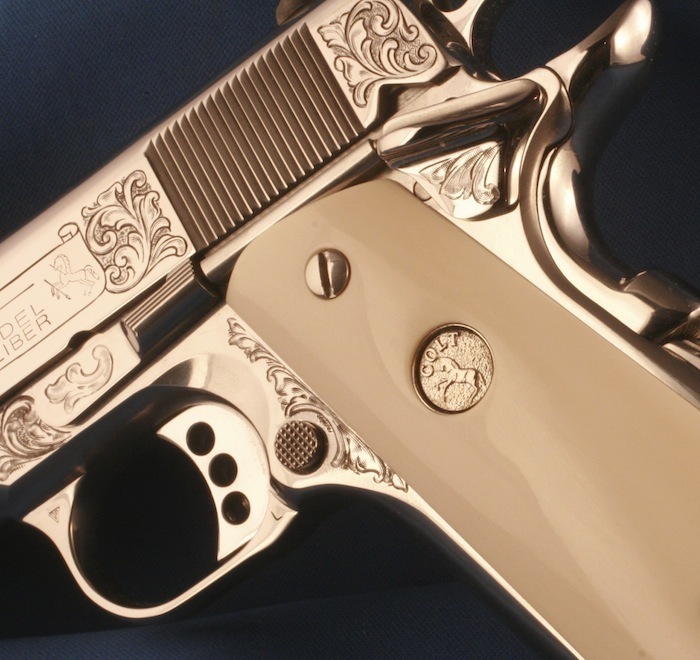 This stainless steel Colt was treated to hours of hand work to bring it to a high polish finish. 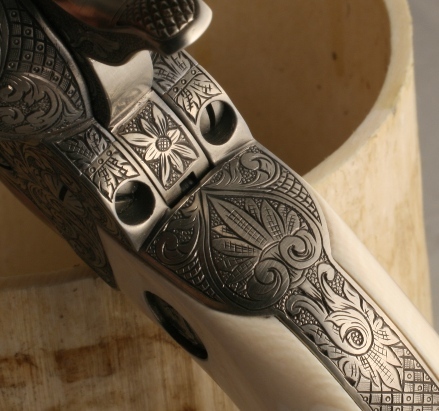 The hand checkered giraffe bone grips have been fitted with deep dish reproduction Colt medallions. 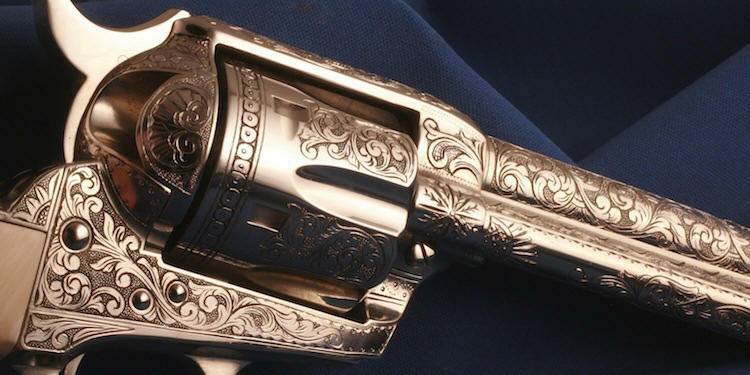 These are the only known medallions where the Rampant Colt faces forward on both sides of the gun. 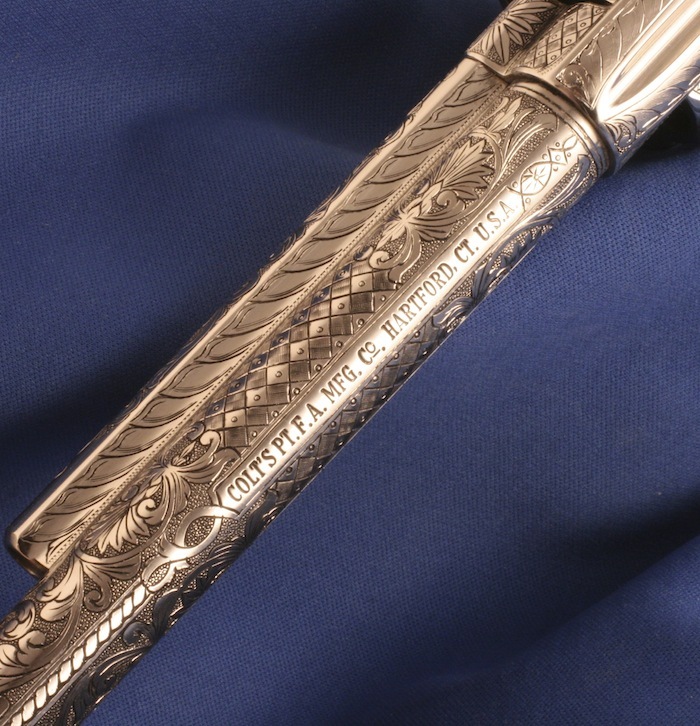 The engraving is a classic American style and covers the sides of the slide, the receiver, the thumb safety, and the slide stop. Our ink and bake treatment on the engraving showcases the artisans work. 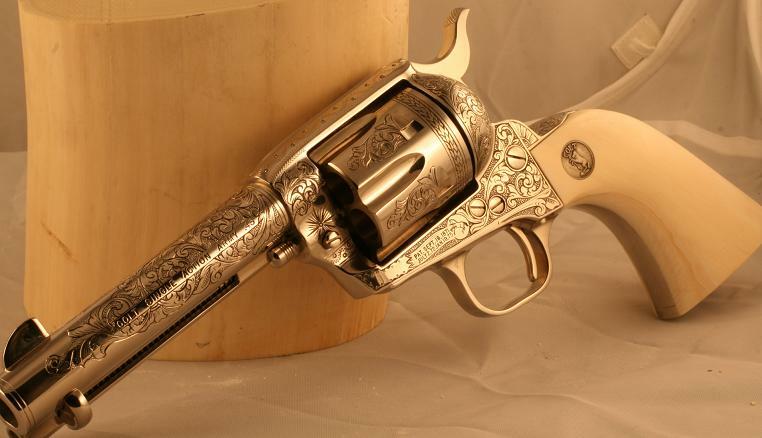 This Colt also comes with a matching knife engraved in the same pattern as the gun. 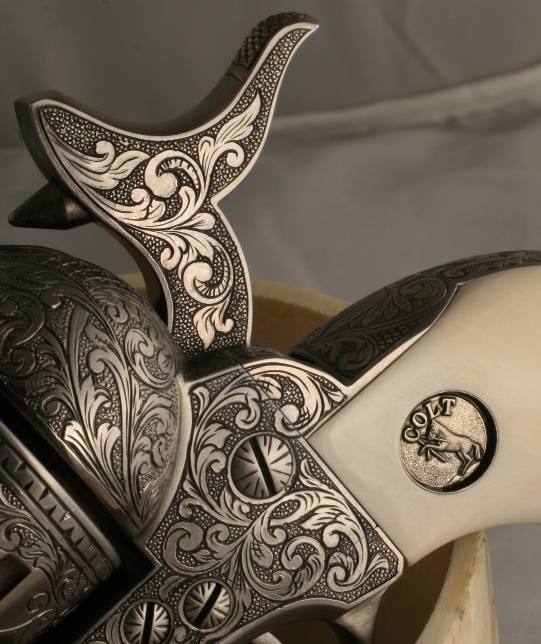 The gun and knife were engraved by the late Larry Peters. Highly regarded for his outstanding craftsmanship, Larry's legacy will live on in this tremendous example of his work. 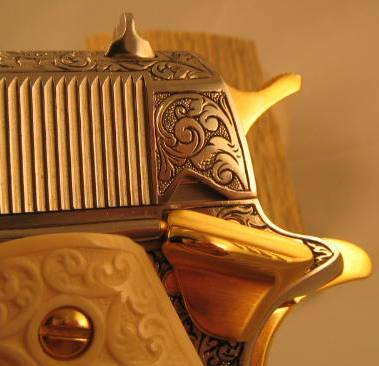 A gun displaying this level of quality could fit nicely into just about any collection. As an added bonus we are including a custom presentation case. This case is Cherry with a solid lid, French fit billiard green interior with a piano hinge and is completely lockable. 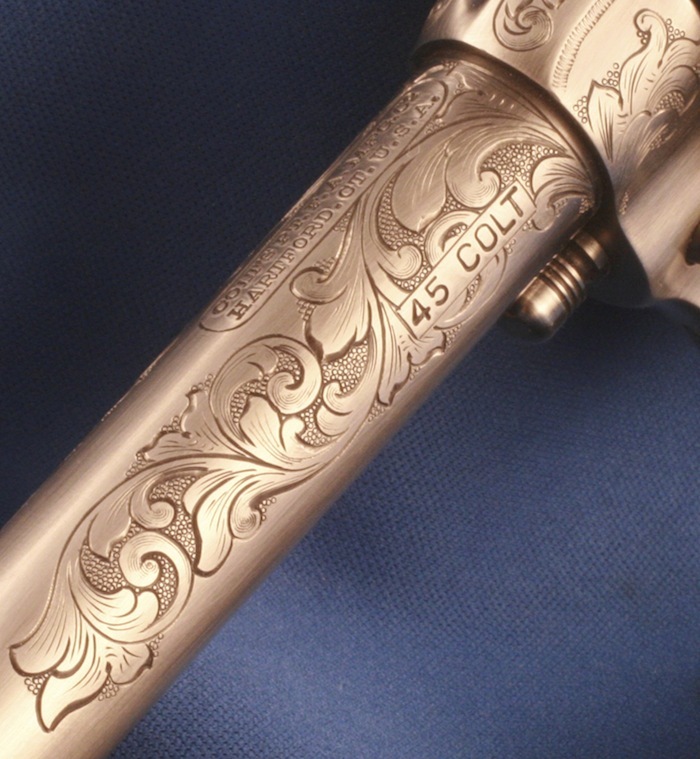 We have a brand new third generation beautifully engraved Colt 4 3/4 .45 SAA available for purchase. This Colt has been finished in bright nickel and our ink and bake process has provided beauty and depth to the finely cut scroll. 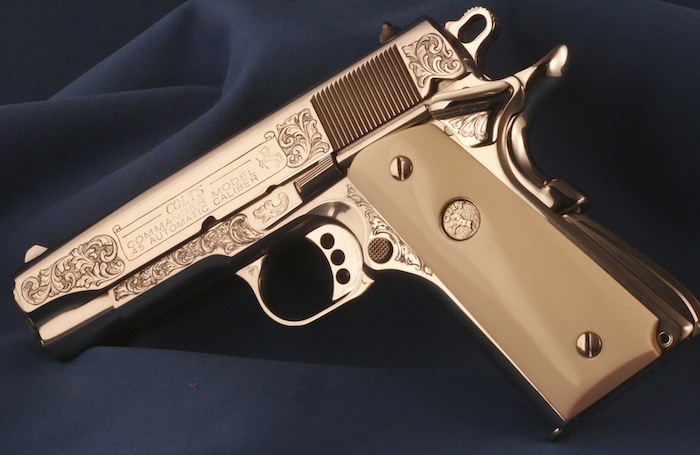 The coverage on this Colt is a very tasteful C+. The cylinder and ejector rod housing have been beveled to give that 1st generation look. We fit beautifully unique one piece bark ivory grips, and performed our custom action tuning and re cut the forcing cone. If you have any interest don't hesitate. here at Nutmeg Sports. We just finished up this amazing transformation. 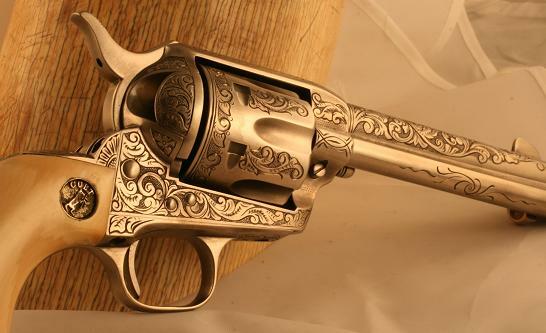 This nickel Colt was sent to us after the finish had become cloudy and pitted due to the result of a fire, The client had always wanted a full carbona blue six gun and we were able to resurrect this SAA to help him realize that dream. Another brand new unfired Colt SAA for sale! 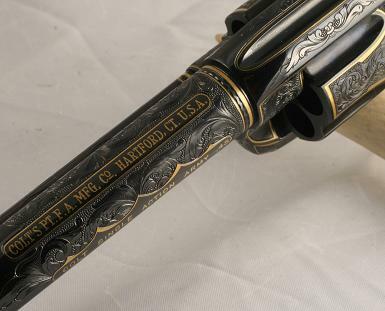 Serial#S73843A This gun has been expertly engraved in a "Cattle Brand" theme. 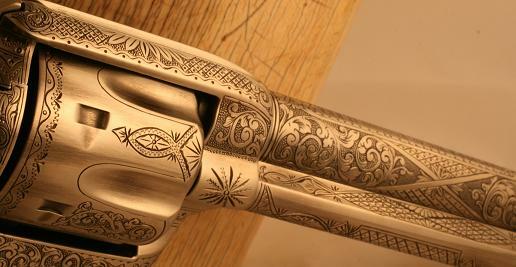 We then plated the gun in a beautiful nickel finish. 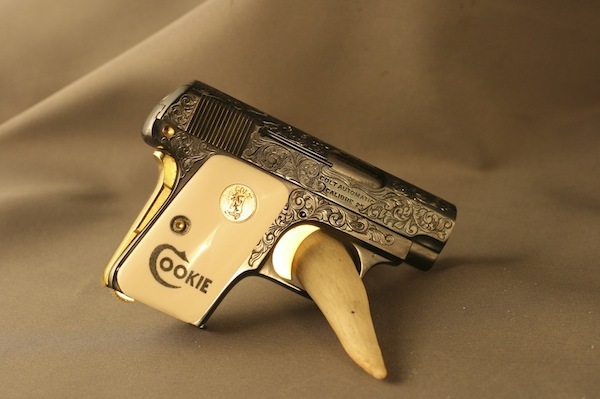 The custom one piece grips are made from Giraffe Bone and tie in beautifully with the tone of the gun. As an added bonus we are including a custom presentation case. This case is Cherry with a solid lid, French fit dark blue interior with a piano hinge and is completely lockable. 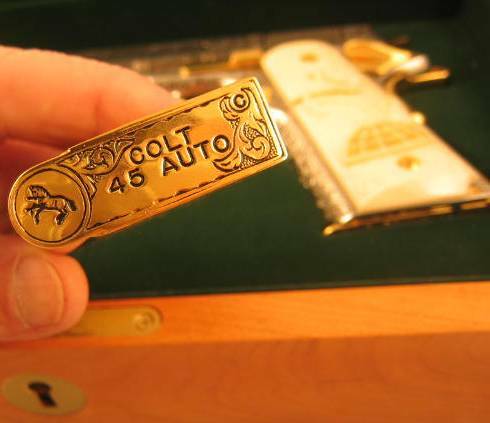 Also comes with original Colt box. Take your opportunity to add this very rare one of a kind cattle brand Colt to your collection. We have a brand new unfired Nutmeg Colt SAA for sale. Serial number S74260A. It is brand new in the box and beautifully engraved. We are offering it in the most popular SAA configuration....45 with 4 3/4" barrel. 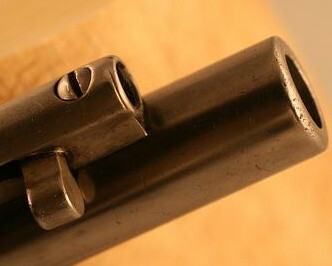 "C+" coverage including engraved front sight, hammer, and ejector rod head. The lavish deep, bold scroll has been expertly applied. 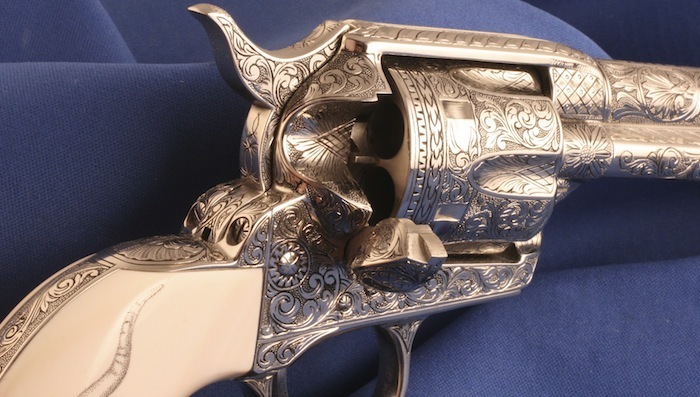 This gun has been richly plated in a bright nickel finish. Then treated to our ink and bake process to bring out the beauty of the engraving. We also tuned the action on this Colt for smooth and reliable operation. 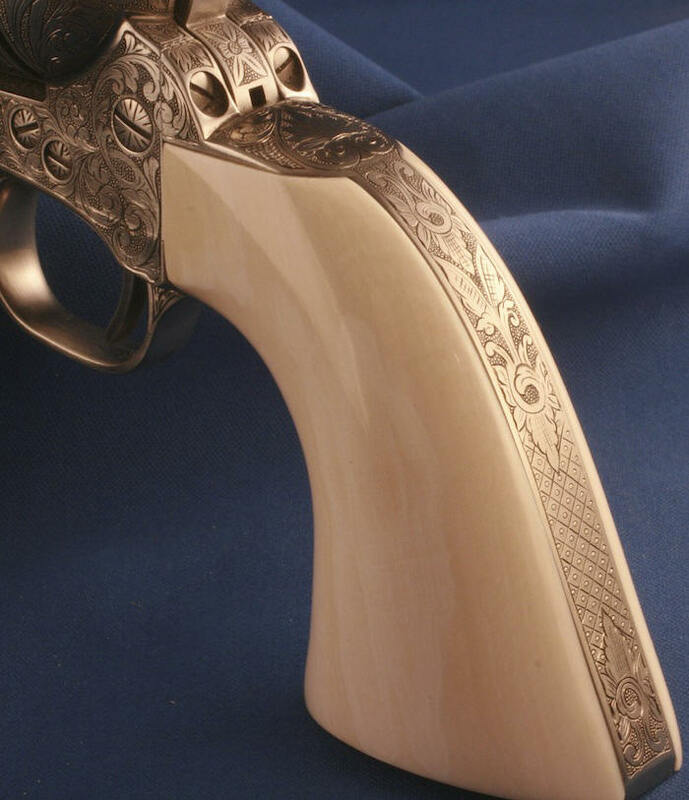 The one piece configured Ram's Horn grips add to the overall beauty of this gun. 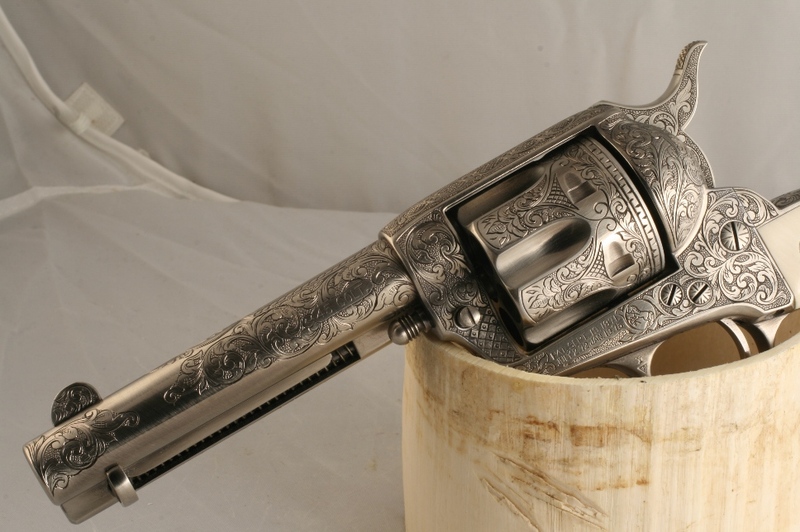 A great Single Action Army for any collection. As an added bonus we are including a custom presentation case. This case is Cherry with a solid lid, French fit billiard green interior with a piano hinge and is completely lockable. Also comes with original Colt box, and paperwork. Just finished these Beautiful Colt Bird's Head style SAA's for a longtime customer. 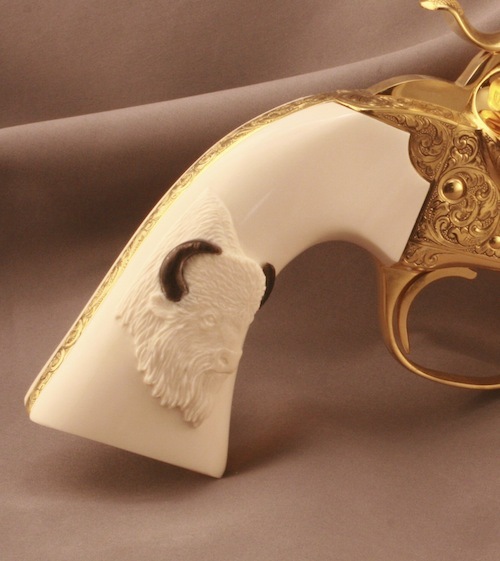 We recently had the privilege of custom fitting the Colt Collectors Association Ladies Gun with these beautiful Ram's Horn grips. This material is another beautiful choice for your SAA. 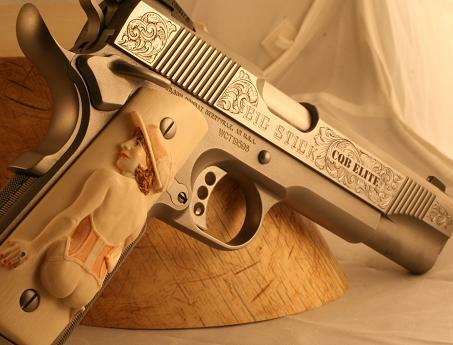 Send in your Colt for some beautiful custom made grips. A pair of birds head SAAs are rare enough! These beauties are engraved, nickel plated and have fire blue accents. We recently completed this beautiful project for one of our very special customers. Unfortunately we do not have any "before" shots of this Bisley. However we are very proud of the final results. Send in your tired beaten up old Colt for some TLC. 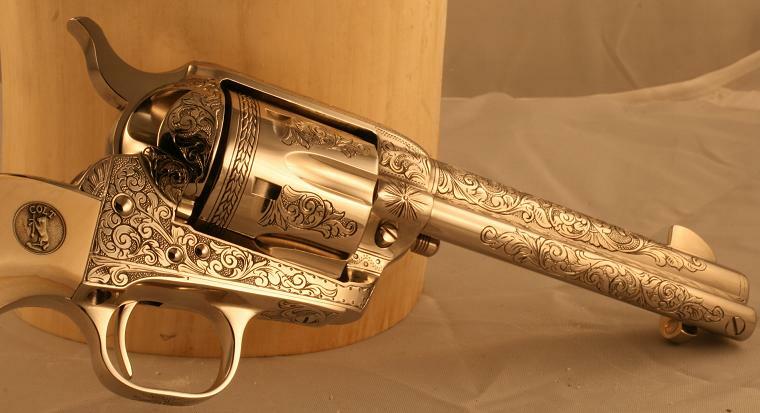 Beautifully engraved Colt Single Action Army 5 1/2" engraved by the world famous, and sadly recently deceased Jerome Harper. in bright nickel with an inked and baked finish. 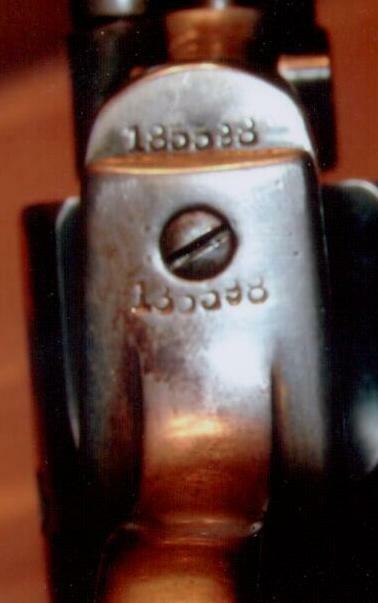 Serial number S73657A has been masterfully engraved with a "C++" level of coverage including the front sight, the hammer, and inside the loading gate. We have a spectacular new Nutmeg Colt for sale. This one, serial number SA94259 is a 45 4 3/4" with great coverage. 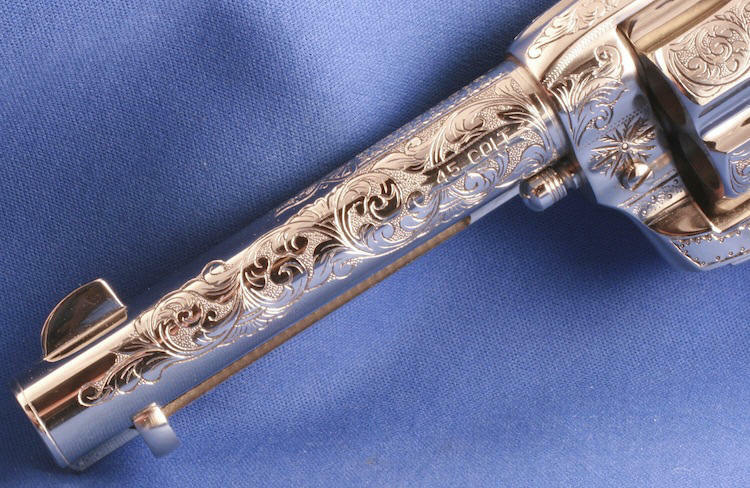 This gun has been beautifully engraved by Carmine Lombardy. It's brand new in the box with a custom tuned buttery smooth action job. We are offering it in the most popular SAA configuration....45 with 4 3/4" barrel. 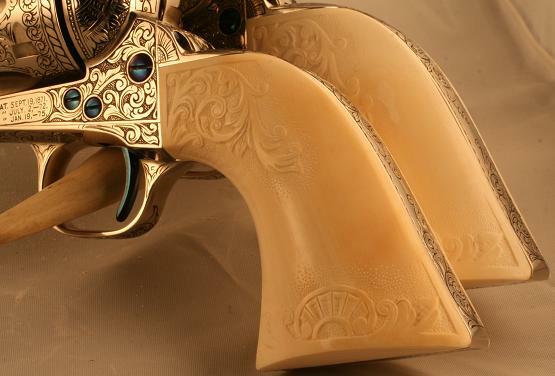 The beautiful giraffe bone grips are wonderfully colored and compliment the gun beautifully. The coverage is very strong and the finish is antique nickel. 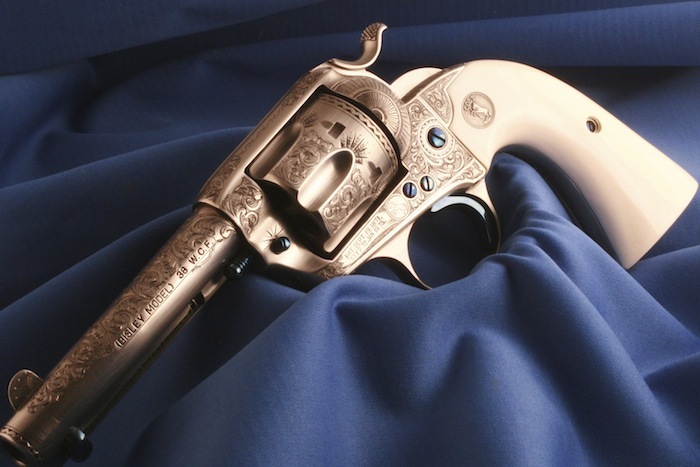 Colt Single Action Army 7 1/2" blue with color case. Custom tuned action and forcing cone. Handcrafted bone grips. Manufactured in 2014. Comes with original box, and grips. We were very happy to be a part of the outstanding Python pictured below. 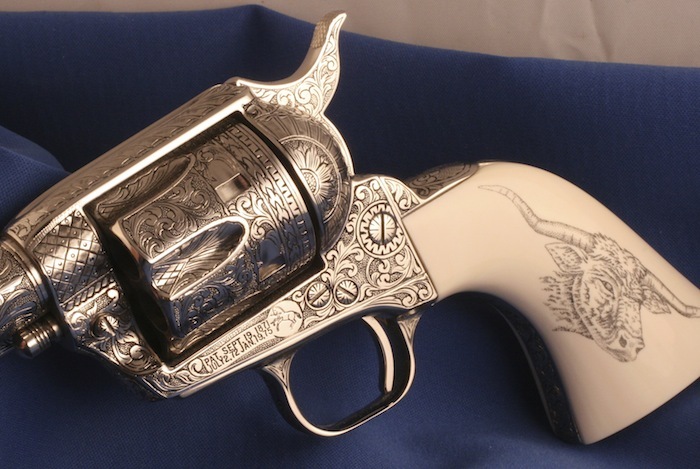 This beauty was done by Master Engraver Mike Dubber. The checkered bone grips were made by us at Nutmeg Sports. 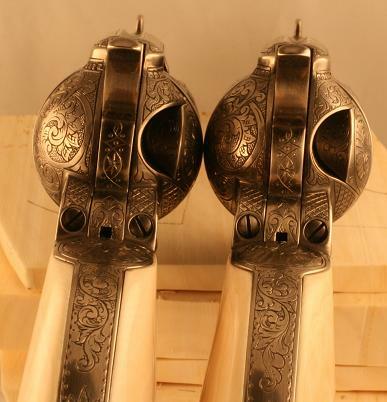 We are offering our customers a rare opportunity to purchase these beautiful Factory USFA Buntine Single Actions. 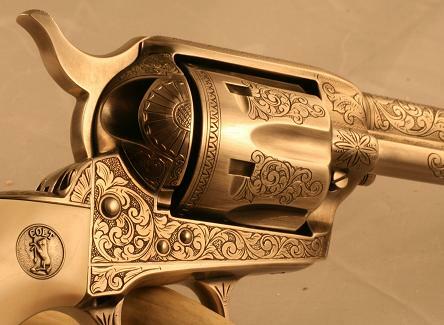 These are beautiful guns, would be great to customize for an engraving project or simply leave as they are. They both showcase exquisite color case and fire blue screws, as well as factory walnut grips. Serial #200008 features a 12" barrel, and #200006 has a 16" barrel. Both guns feature front blade sights, and Folding leaf sights, and Bullseye ejector rod heads. These two guns were originally featured on USFA's "Wheel of Guns" display that was used at various shot shows and at the factory museum. We are excited to introduce our newest SAA for sale. 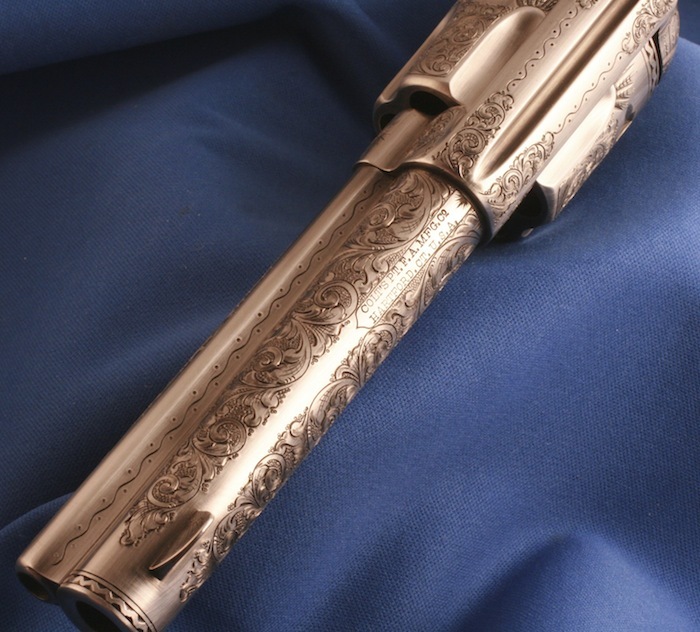 This 4 3/4" SAA has been beautifully engraved with a C++ coverage by renowned engraver Jerome Harper. Finished in our beautiful antique nickel. 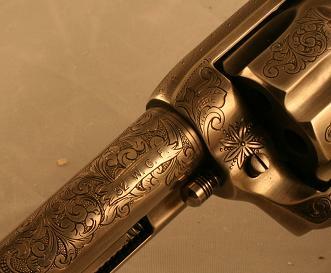 Wonderfully engraved with great coverage. 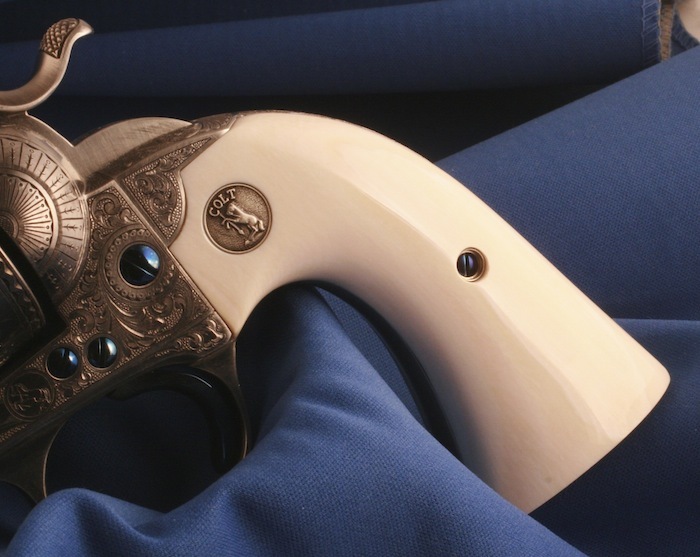 This gun has been treated to Nutmeg's signature action job, and features beautiful genuine Giraffe bone grips. This gun won't last long. 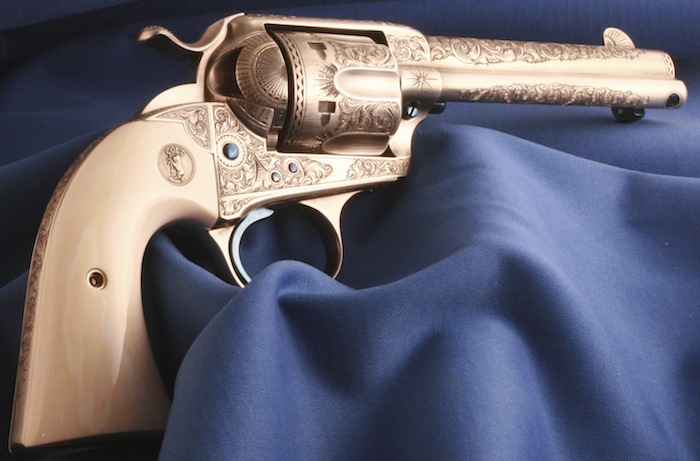 Nutmeg Sports is proud to offer this beautiful Colt 25 Auto for sale. 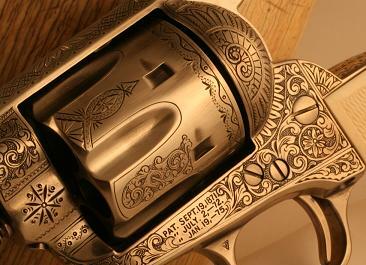 It has been meticulously engraved by renowned engraver Dennis Kies. 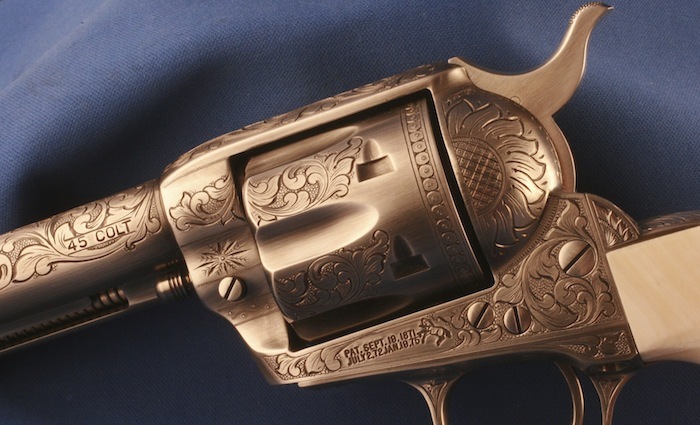 Virtually every surface of this little gun has been touched by the artist's chisel. 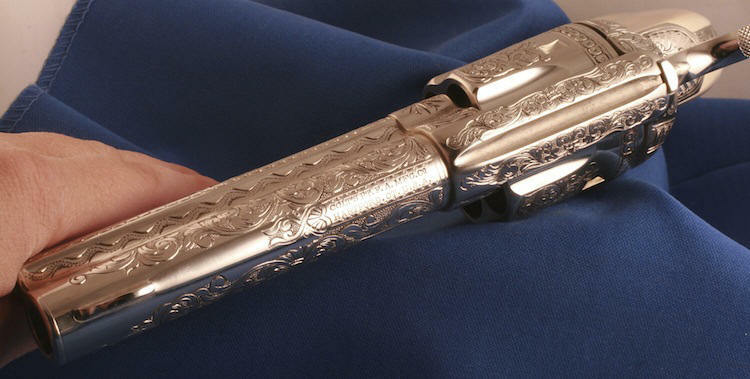 We finished this beauty in our antique nickel finish, and then made these unique giraffe bone grips with antique pewter medallions. We've been hearing alot more about "Cattle Brand" theme guns these days. 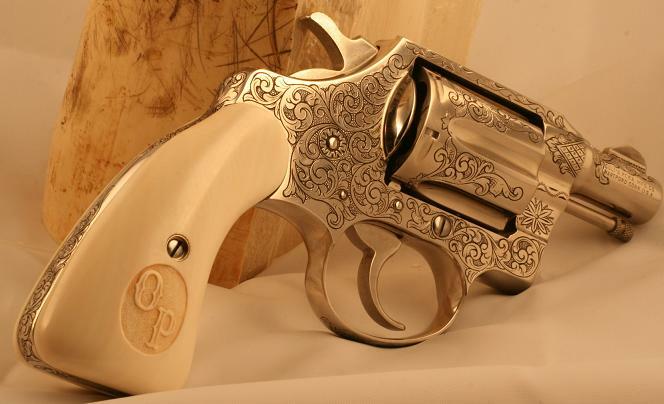 This is a beautiful example of a gun that we did a few years ago for one of our customers. 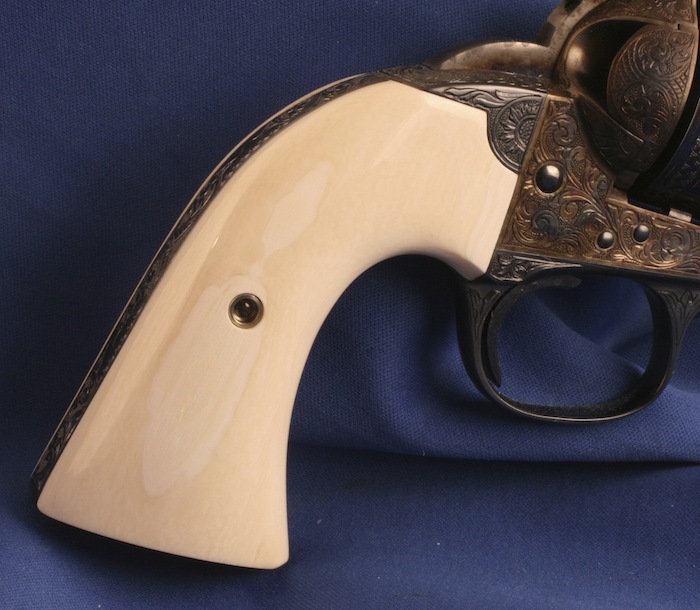 Although this gun is sold we can re-create a similar gun as a special order. Please call or email for pricing on your future project. We'd love to hear from you. We are proud and pleased to present a brand new Colt stainless steel Gold Cup serial number GCT46342. 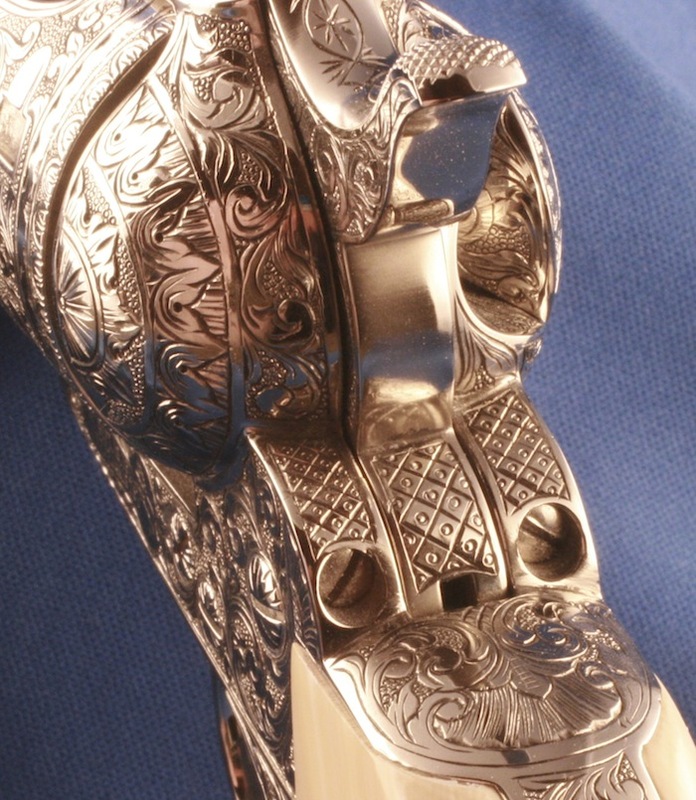 The Gold Cup for decades has been known as the finest shooting semi-automatic in the world and is the standard for competitive guns. Now we have taken this wonderful classic design and brought it to a new level of function form and beauty. We began by elevating the finish to an ultra bright stainless steel. 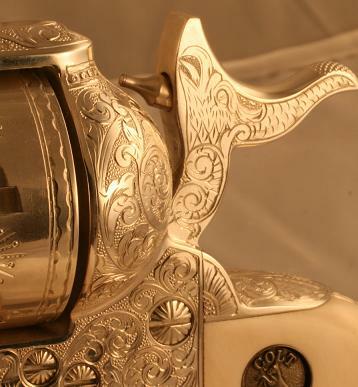 We then engraved this Gold Cup with a spectacular 100% coverage of masterful American Scroll. 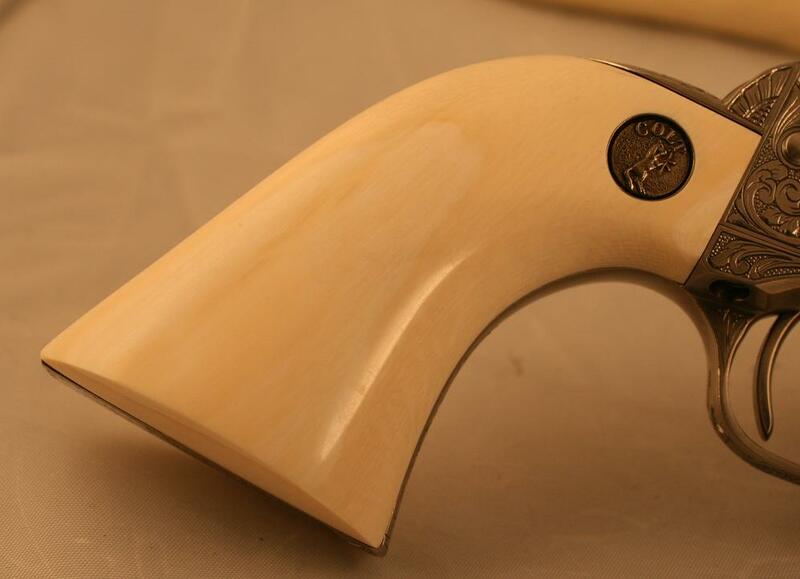 Lastly we fitted our gun with beautifully grained genuine pre-ban African Elephant ivory grips. This is one of the best new guns we have shown lately. It is for sale and can be yours. Engraved by Mr. E.L. Peters. The gun itself is nothing short of spectacular. 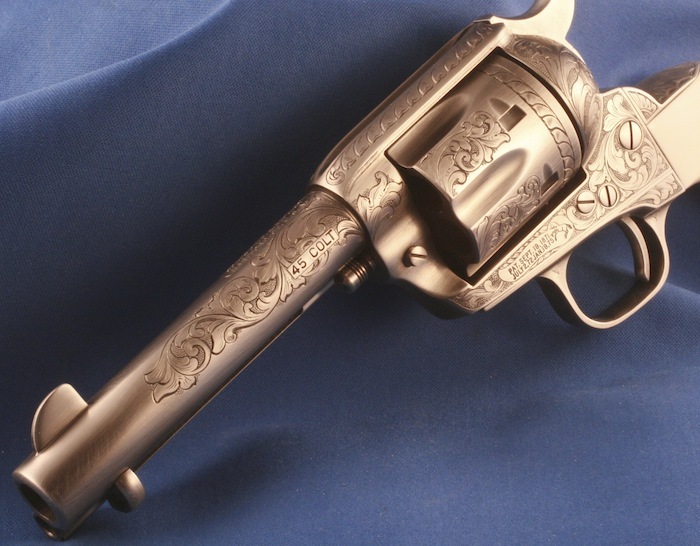 To start with, this is a black powder style frame Colt. Absolutely the hardest modern frame configurations to find at any time. In today's market you just cannot find them. The caliber and barrel length are the most desirable, 45 and 4 3/4". The engraving is nearly a "D" coverage. 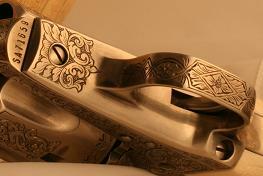 Mr. Peters has engraved the hammer and front sight as well as the inside of the gate surface. 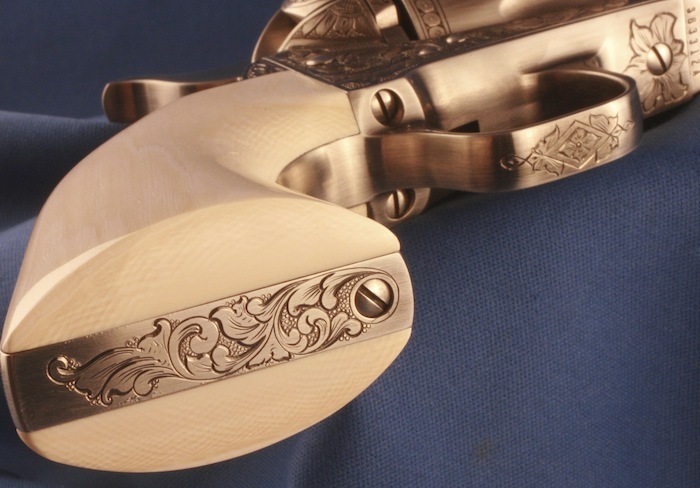 The grips are one piece configured documented pre-ban ivory are aged and match perfectly. It's bright nickel with ink and bake. Brand new and unfired in the original box, it can be the crown jewel of any collection. 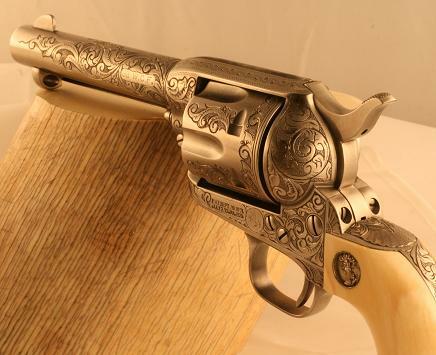 Here is a beautiful 5 1/2" Colt SAA for sale. Serial number S74940A. Finished in our beautiful antique nickel. 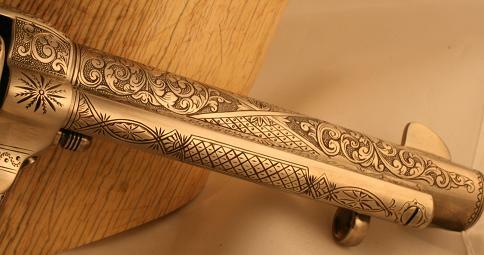 Beautifully engraved with great coverage. 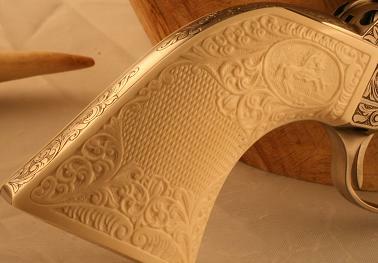 This gun has been treated to Nutmeg's signature action job, and features stunning genuine ivory grips. This gun won't last long. Another new Nutmeg Colt. This one, serial number S47743A is a 45 4 3/4" with great coverage. It's brand new in the box with a custom tuned buttery smooth action job. Bright nickel with ink and baked finish. Beautifully matched ivory with antique pewter medallions. A hard gun to beat. Check out the pictures. Our latest gun for sale is a classic Colt 1911. It is a series 80 serial#CJ50045. 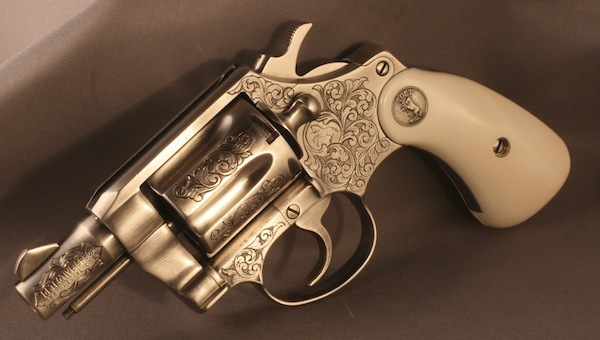 This beautiful Colt is brand new in the box and has not been fired. 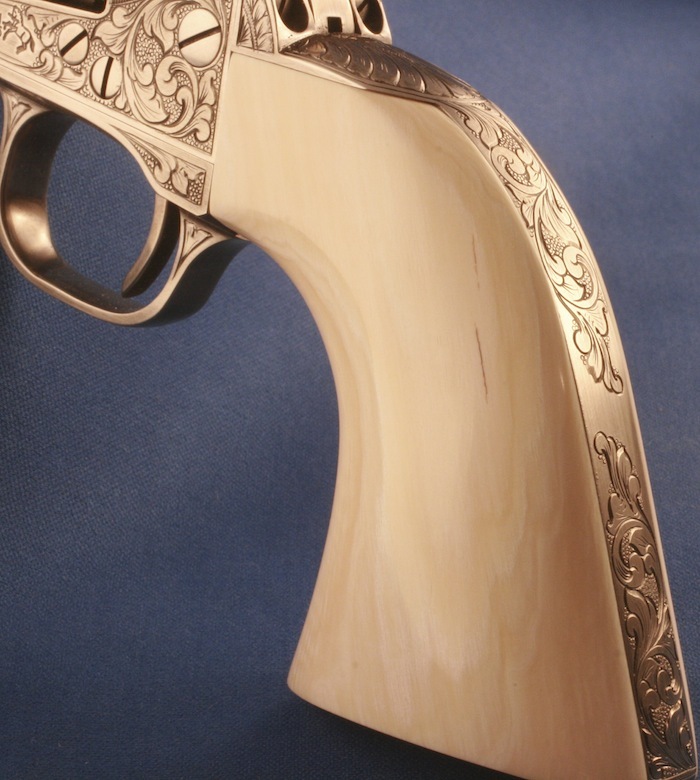 The finish on this gun is a beautiful highly polished Stainless Steel. 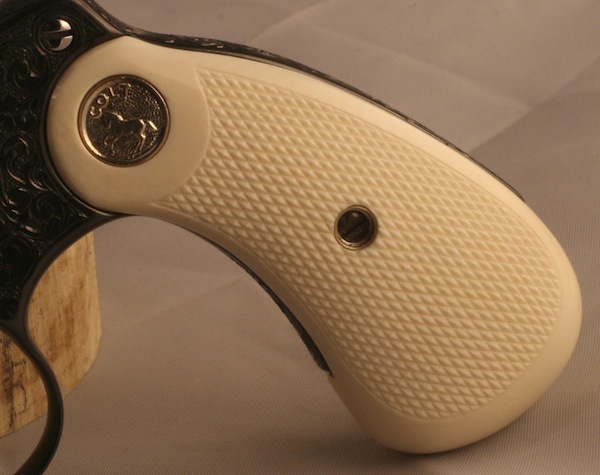 The genuine pre-ban African Ivory grips have been fitted with deep dish reproduction Colt medallions. 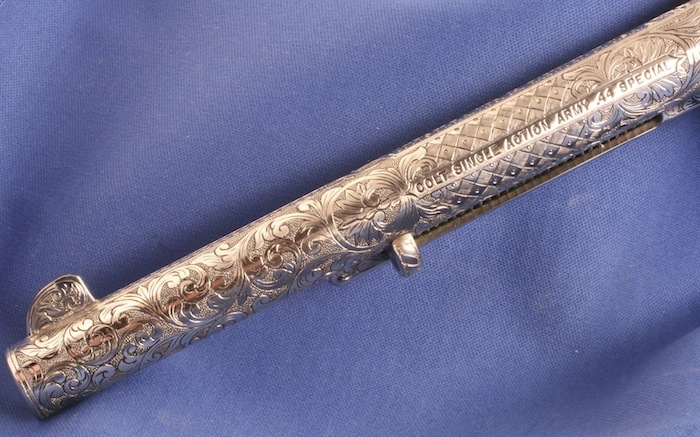 The engraving is a classic American style and covers the sides of the slide, the receiver, the thumb safety, and the slide stop. We then did an ink and bake treatment on the engraving. 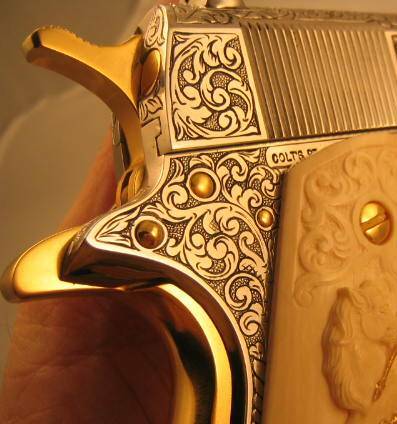 A gun displaying this level of quality could fit nicely into just about any collection. 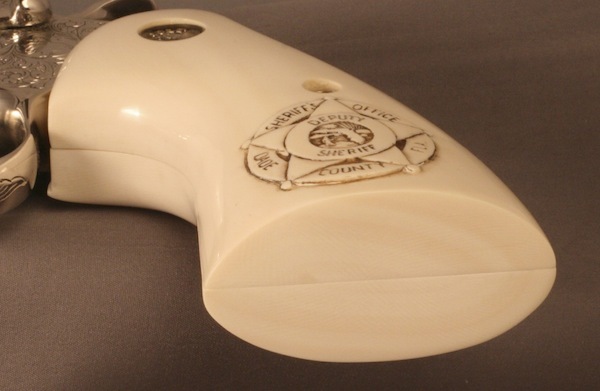 The ability to still purchase a gun with ivory could become a thing of the past. Don't miss this opportunity. Here we have another new Colt for sale. This one shows a very strong D- coverage. Nearly every square inch of this masterpieces has felt the artist's chisel. The front site and hammer are engraved. The panel screws have each been meticulously engraved. 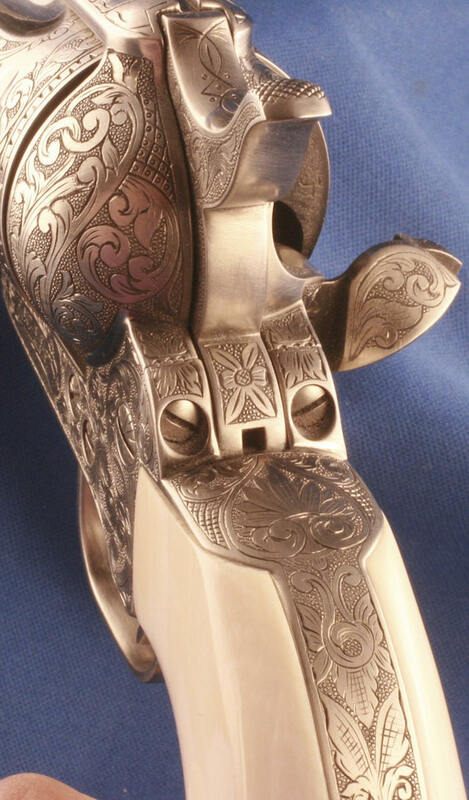 The trigger guard where the fingers wrap on the inside is engraved. The loading gate pocket, as well as the inside of the loading gate is engraved. These details place this gun is a category by itself. 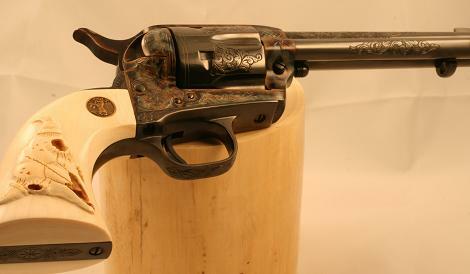 This Colt also has received a custom tuned action. 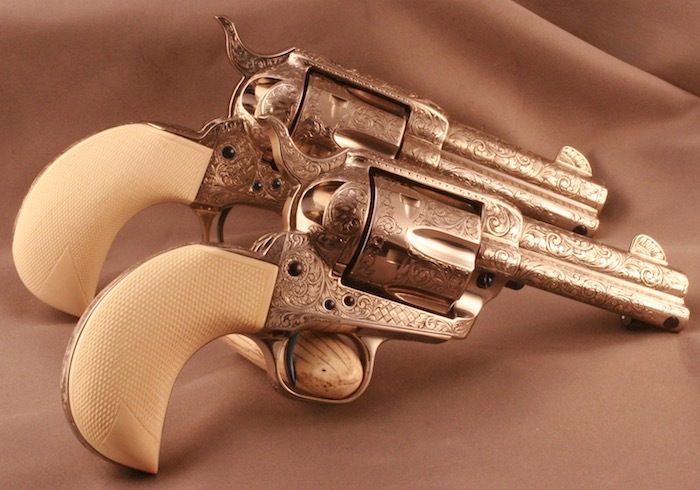 The grips are Nutmeg's usual perfectly matched pre-ban African Ivory. A spectacular gun. 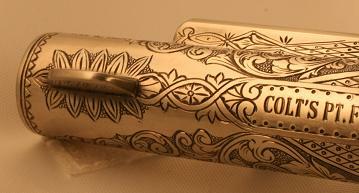 We often receive a client's old gun for engraving. 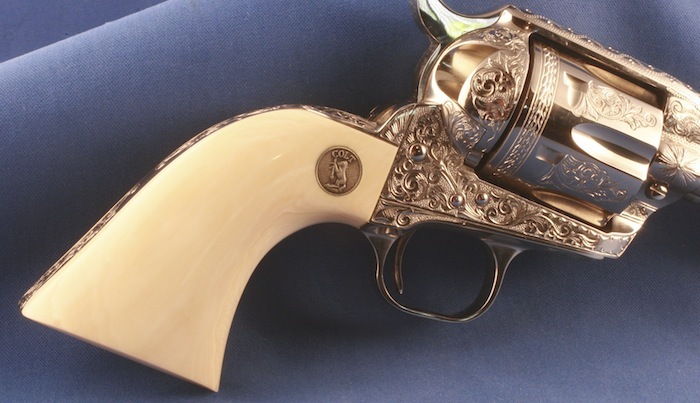 The Bisley shown below is one such gun. It was kind of a rat when it got here. It needed of a lot of our expertise to elevate it to what you see today. 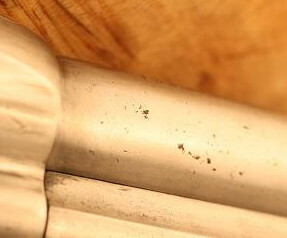 It required extensive polishing, new roll markings. The owner of the gun is a Native American and he came up with the plan. 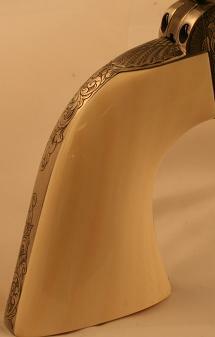 He decided on sterling silver plating with Native American pennies embedded into our carved ivory surface. He selected the pennies dated 1907 to match the vintage of the gun. Need we say more? Just view and enjoy the pictures, and contemplate sending your old gun to us. Here is our latest gun for sale. Serial number S63312A. It is brand new in the box and beautifully engraved. We are offering it in the most popular SAA configuration....45 with 4 3/4" barrel. 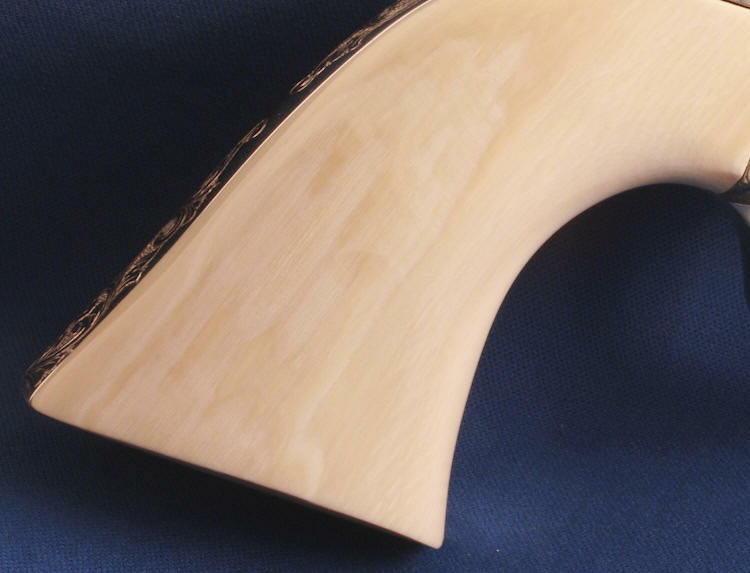 The ivory grips are wonderfully colored with matching grain from side to side. The coverage is very strong and the finish is antique nickel. Everyone is aware of what is happening with the cost and availability of the Colt SAA. You just can't find them, and if you do happen to stumble on one it is way overpriced or in an undesirable configuration. 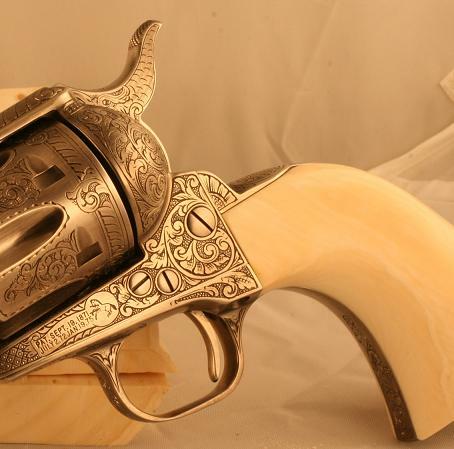 To find a gun like this one, and fairly priced would be a real strong challenge. 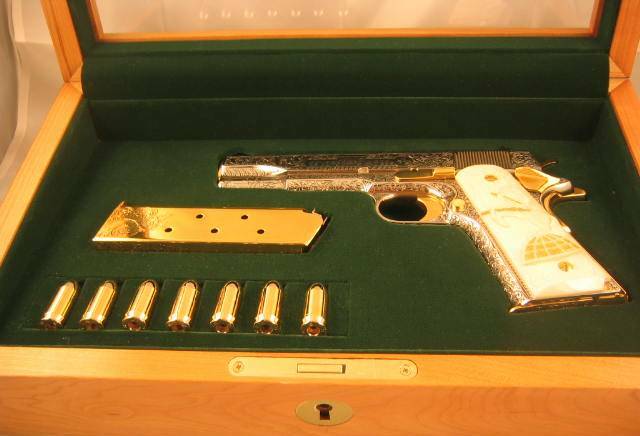 We feel the price is fair considering this model gun is selling for about $2K. Add the ivory and you are approaching $3K. That's before any of the prep work, engraving, or special plating. 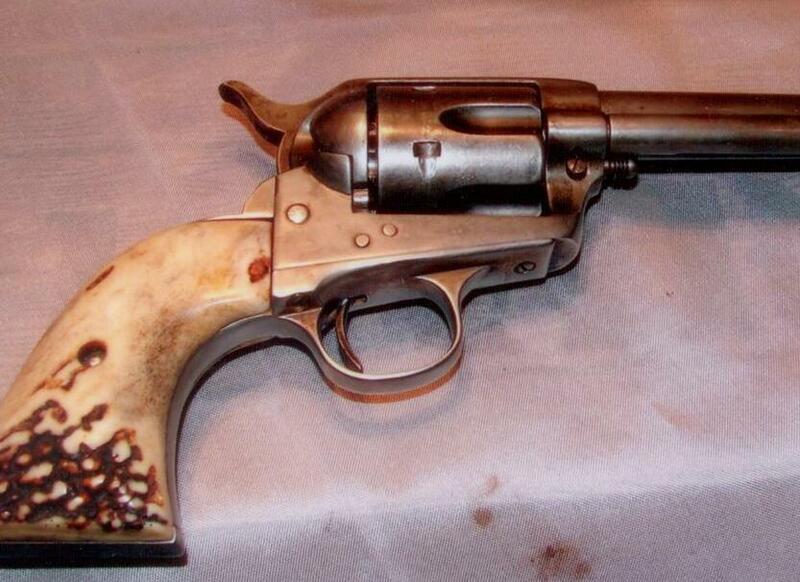 Check out this nice little Remington .41 Caliber over and under Derringer that a customer sent us. We transformed it from a small paperweight into a very attractive ivory handled engraved antique. 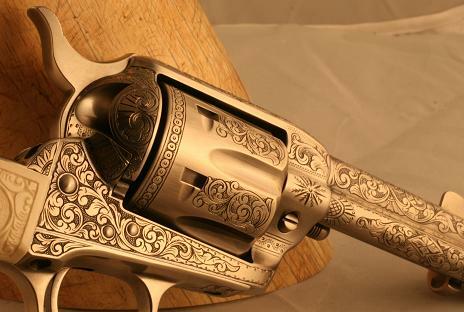 We can do this to your Remington as well. Here is an opportunity for you to own one of the most iconic hand guns of all time from WW1 continuing thru today the Colt 1911 continues to be the choice of many. 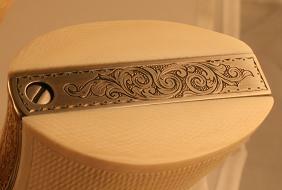 This particular one is beautifully engraved, and has been nickel plated. 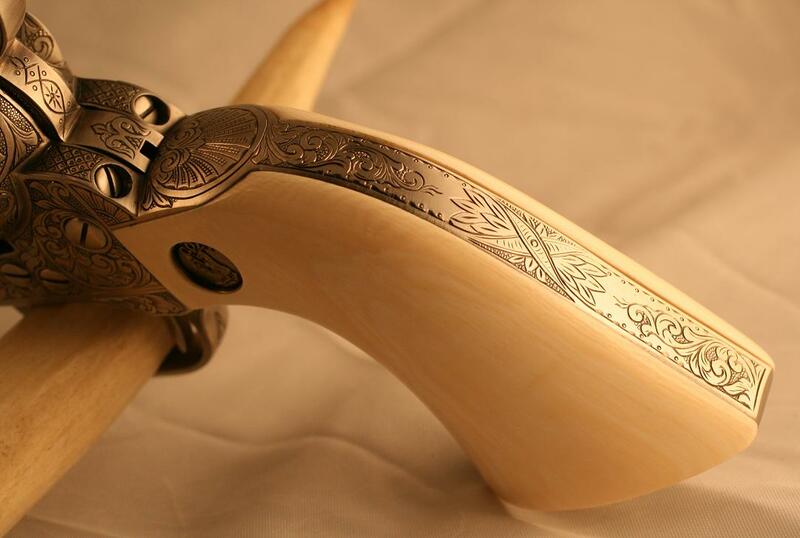 It is adorned with pre-ban genuine African Elephant ivory. 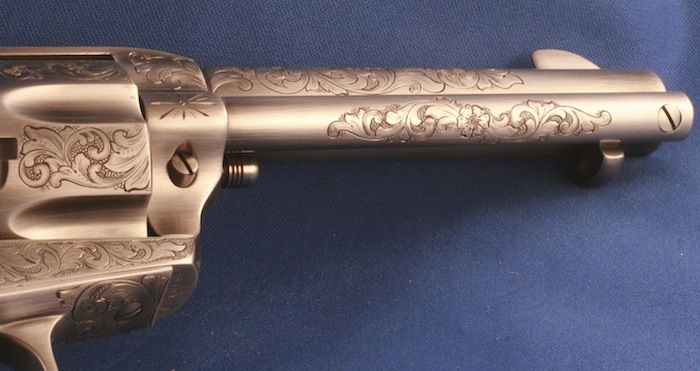 The grips have been fitted with reproduction antique Colt medallions. 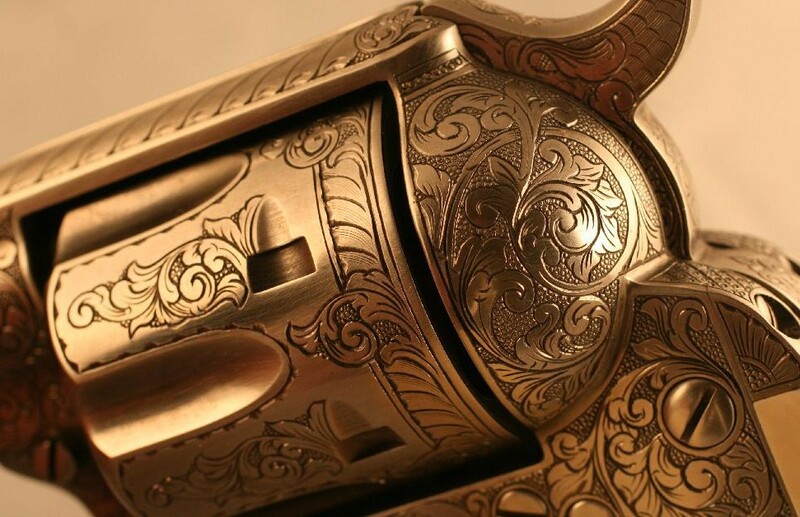 These are the only known medallion where the Rampant Colt faces forward on both sides of the gun. As an added bonus we are including a Colt custom presentation case. This case is American Walnut with a solid lid, French fit interior with a piano hinge and is completely lockable. The serial number of the gun is 2864316. 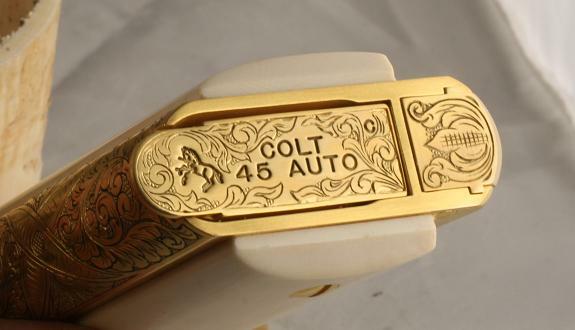 For you collectors out there that want a great engraved Colt SAA but want to see a little bit more of the gun, this one might be just for you. 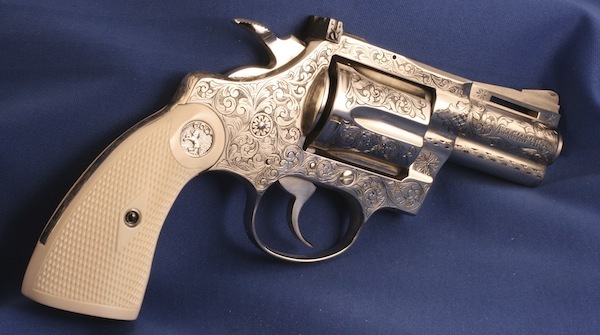 It is the ever popular 4 3/4" in .45 serial number S67912A. 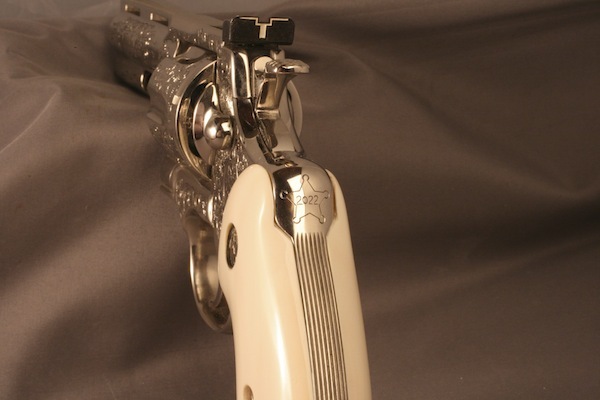 It has a custom tuned action, antique nickel finish, with perfectly matched colorful pre-ban African ivory grips. 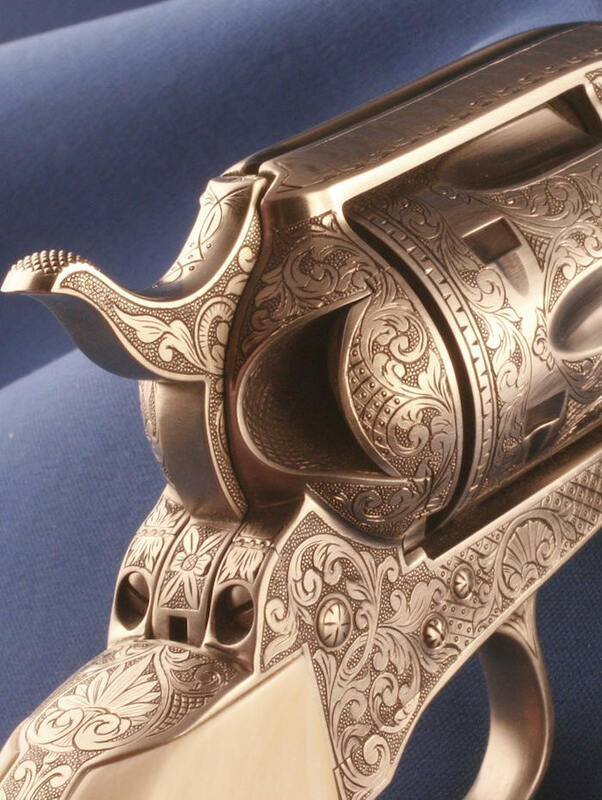 The quality of this "C" turn of the century engraving is nothing short of masterful. Signed by the artist, it is brand new , unfired with all of the Nutmeg usual extras including the box, hang tags, instruction manual etc. 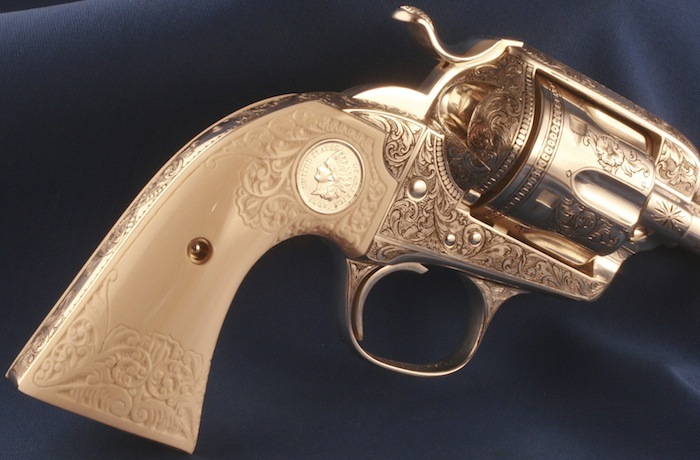 This is a beautiful 2nd generation Colt third model Dragoon 7 1/2" 44 caliber. It has been engraved by Jerome Harper and the late Floyd Warren. It has been finished in color case and blue with 24K gold line work, and high relief inlays. 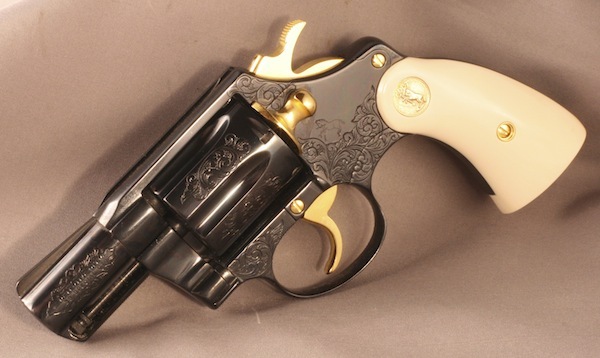 Floyd Warren has applied some of his finest scroll to this Colt including flush 24K gold linework on the barrel, the wedge, and the cylinder. 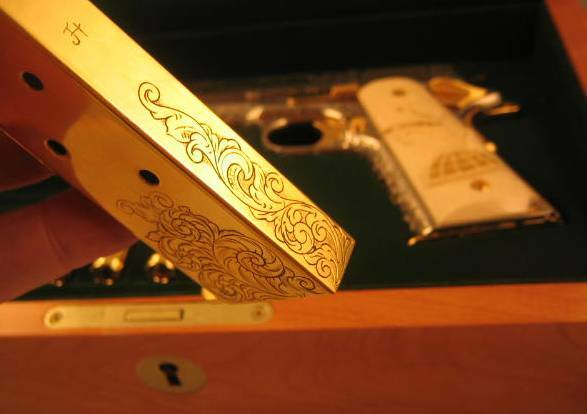 After the flush gold was applied, he continued working with the precious metal to create three very fine high relief solid 24K gold inlays. The left side of the barrel displays a flawless likeness of General Robert E. Lee. The opposite side of the barrel show another wonderful inlay of General Ulysses S. Grant. 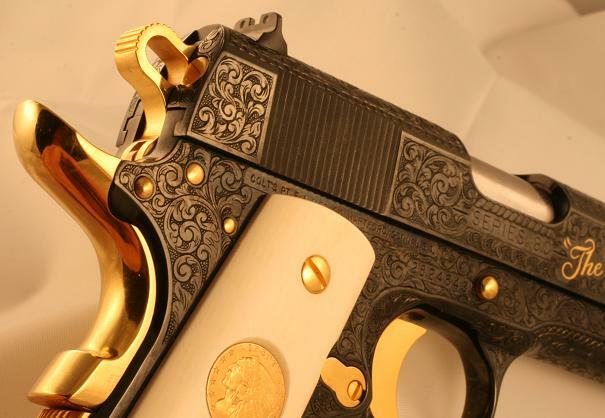 On the top radius of the barrel is yet another high relief 24K gold inlay of Samuel Colt. 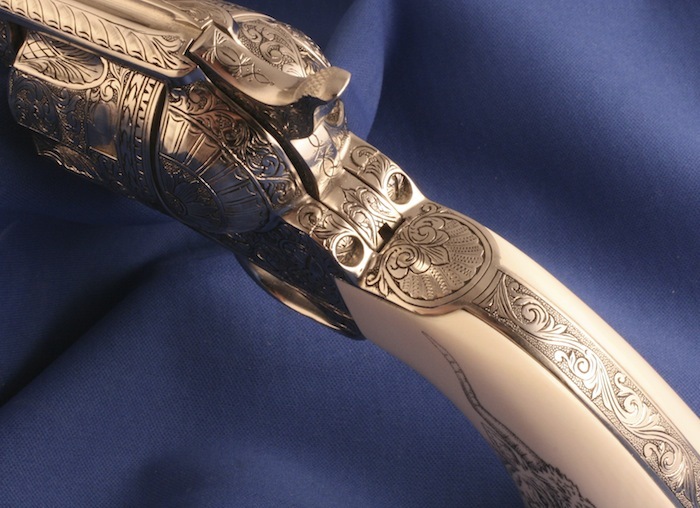 This masterpiece has been fitted with one piece African elephant ivory grips with high relief hand carving and checkering. 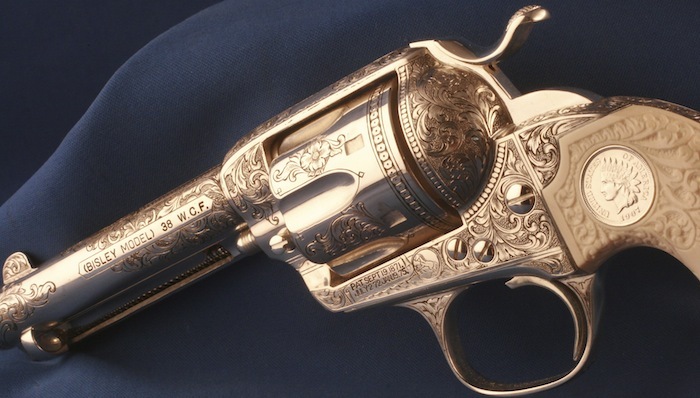 A very historically significant collectable that could easily be the crowning jewel of the most discriminating Colt collection. The dedicated employees at Nutmeg Sports LLC have created yet another Colt masterpiece for someone's valuable collection. 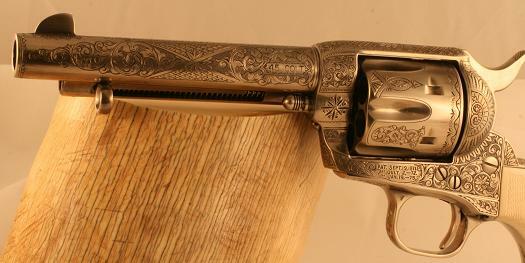 It is a Colt Single Action Army revolver, serial number S73652A. A 4 3/4" .45. It it brand new, unfired and in it's original Colt packaging. During our reassembly we had our Master gunsmith apply one or our trademark custom tuned action jobs. Now the cocking function operates as it were on smooth ball bearings but the lock up is as tight as a drum. 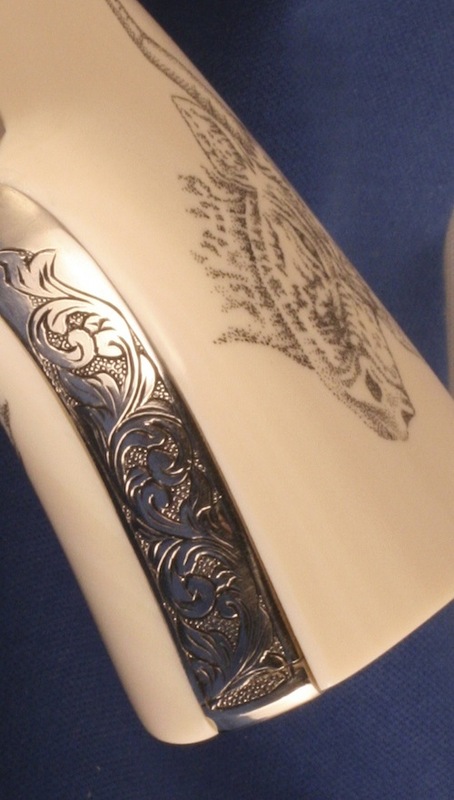 The engraving pattern is one of our favorites. 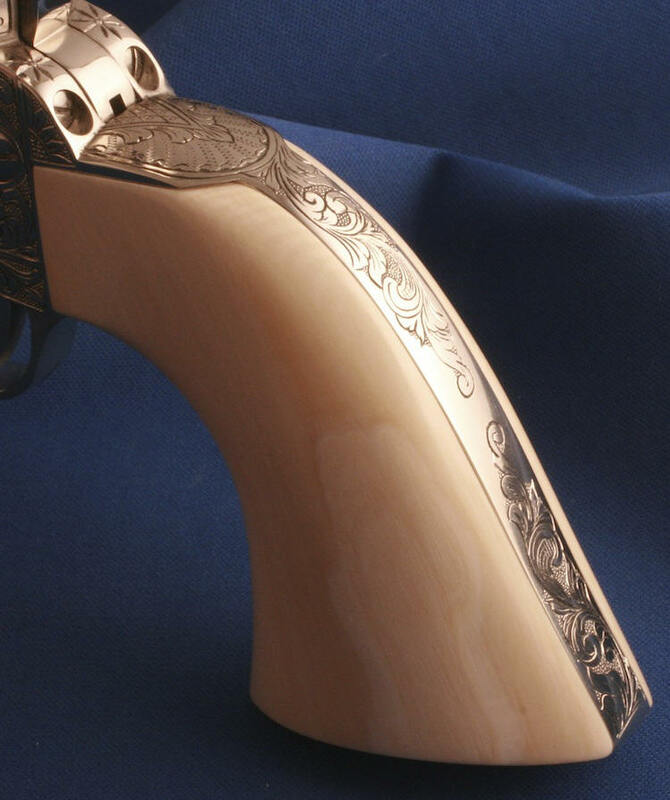 The scroll flows from the frame down onto the trigger guard and over to the backstrap ears giving the appearance of one seamless transition from part to part. The inside of the gate and the gate seat are engraved as is the hammer and front sight. Even the panel screws have not escaped the engravers chisel. We selected the antique nickel finish. It is our most durable and popular finish. The engraver was so proud of this one that he signed it three times. 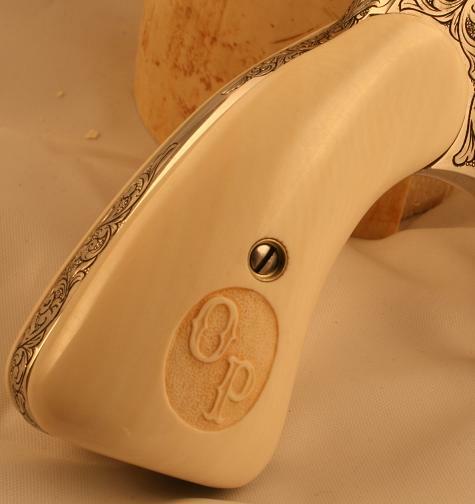 The grips are pre-ban genuine African elephant ivory showing very fine grain and character that matches from side to side. 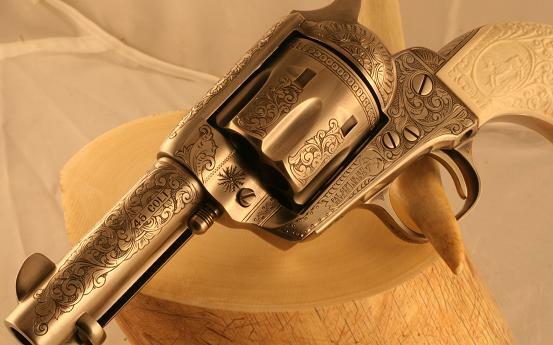 This Colt will fit into the finest of any collection. Here it is...another smashing SAA from NUTMEG SPORTS, LLC. It's about as close to a "D" coverage as you can get. 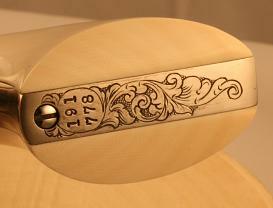 Even the panel screws, gate, and gate seat are engraved The only real open areas are the cylinder flutes. 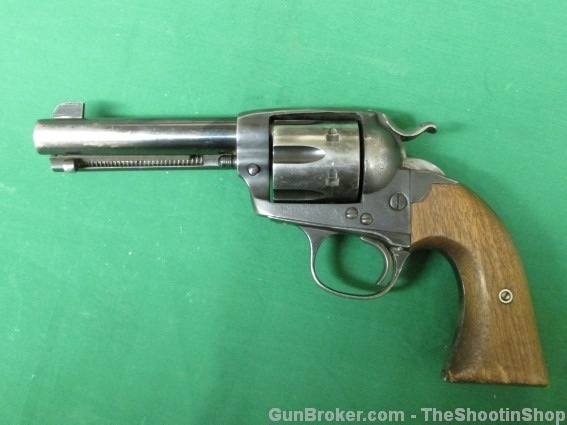 This one is a 45 long colt with a 5 1/2" barrel. Serial number S66842A is absolutely brand new in it's original blue box with white outsider and all the hang tags etc. as it came from Colt. Old style roll marks and metal work. Custom tuned buttery smooth action. Nickel plated with ink and bake finish. Signed by the engraver. 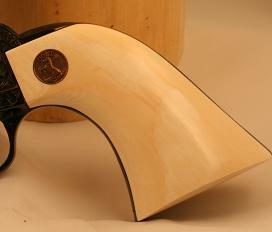 Check out the one piece coffee colored pre-ban African elephant ivory. How can you not love this gun? AND, where can you find another one? It's another brand new in the box Colt SAA. 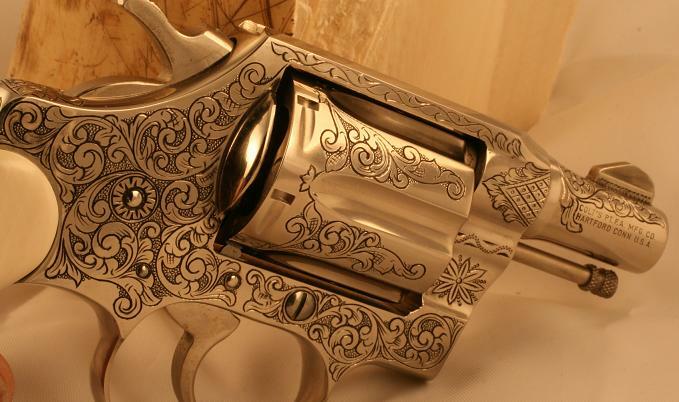 It is the classic .45 4 3/4" in bright nickel with an inked and baked finish. 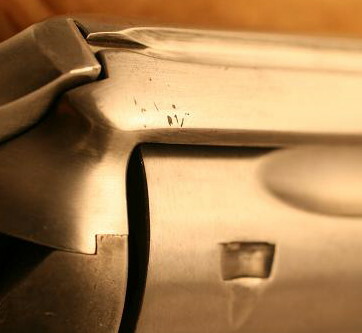 Serial number S67053A has been masterfully engraved with a "C++" level of coverage including the front sight, the hammer, inside the loading gate and even the gate pocket. 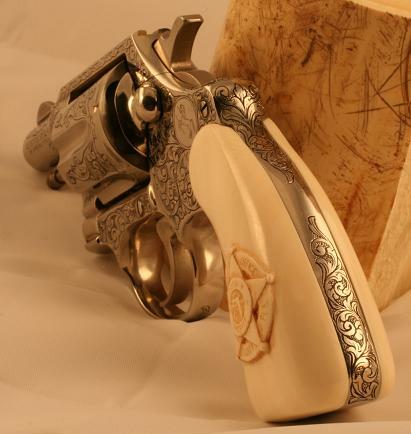 The grips are pre-ban African elephant ivory in the one piece configuration. 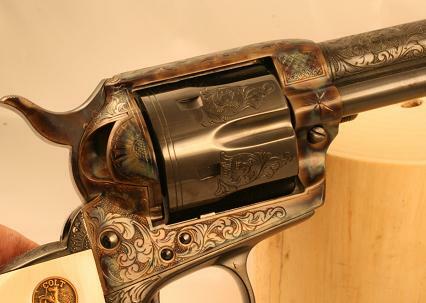 This colt would shine in the finest of collections. Yes! It is yet another Colt SAA .45 4 3/4". Brand new, unturned, unfired, original Colt blue box with white outsider, hang tags, paper work, and owner's manual. 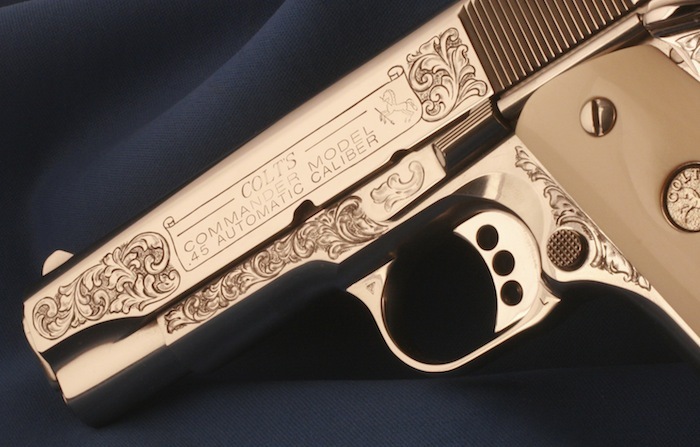 Engraved with a strong "C" coverage, serial number S67922A is a spectacular example of American craftsmanship. 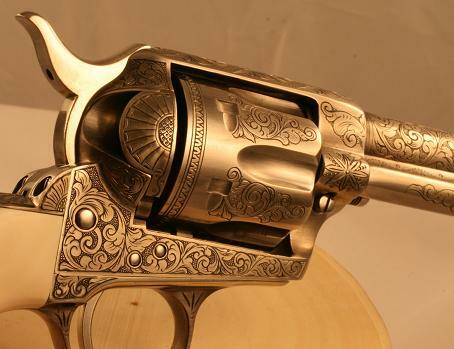 This Colt screams with turn of the last century details. We have applied all of the correct roll marks from that era including the two line address correct for a 4 3/4" gun and the 45 Colt caliber marking. 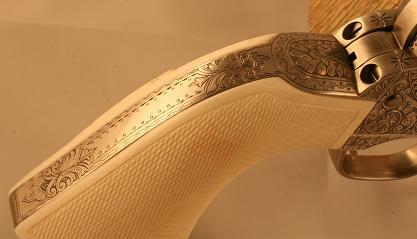 The metal work is all early Colt from the beveled cylinder flutes to the chamfered toe and heel on the backstrap. Just takes a little more time but it's done right. 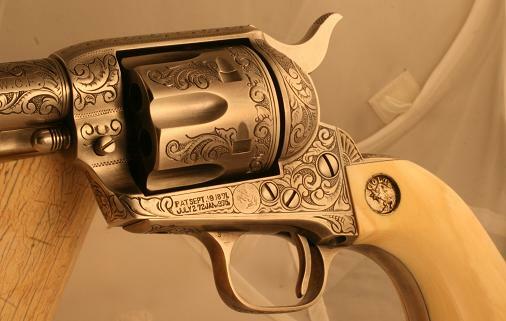 The engraving is our typical flawless class in the "Cowboy" style engravings of the late 1800's and early 1900's. We have included a custom tuned action job that gives the gun a silky smooth action but it locks up like a Fort Knox vault. The one piece configured genuine pre ban African elephant grips show a mellow flowing ribbon of yellow grain. Lastly, the finish on this one is our exceedingly popular antique nickel. Check out Gun Broker and Guns America and Guns International. You won't find anything like it. CHECK OUT THE NUTMEG CREATIONS PICTURED BELOW!! Here is one of our recent client creations. 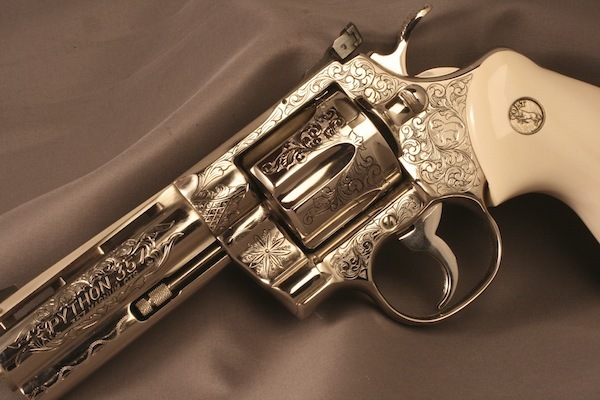 A Colt Bisley that has been dressed up with class. 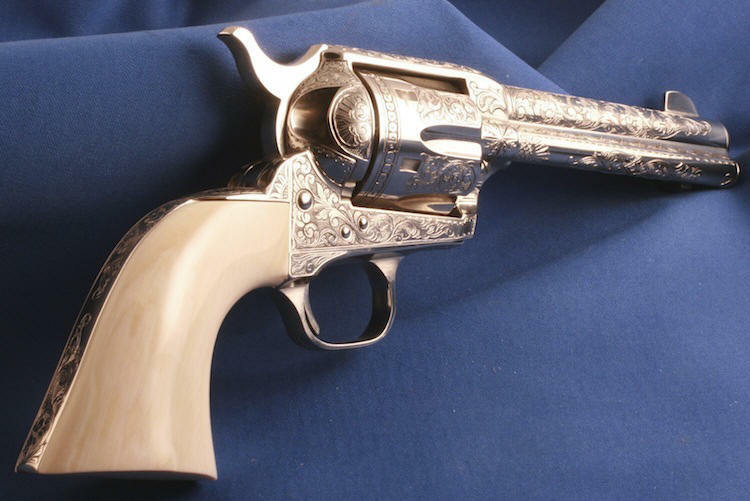 About 3/4 master quality engraving coverage, a complete fire blue package, antique nickel plating, ivory grips and antique pewter Colt medallions make this gun like no other Bisley you have seen or are likely to see again. 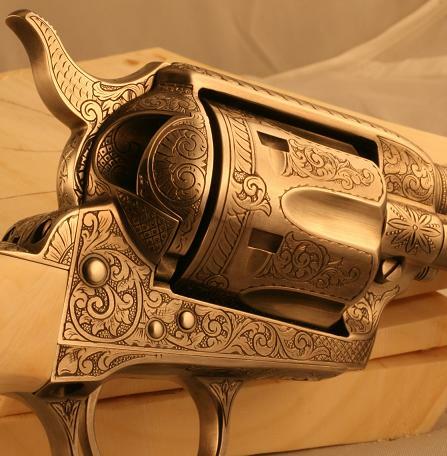 If you have an old Colt hanging around that is looking tired and you want to give it a new look, we can help you. Here is a spectacular Colt SAA that a client sent us. It was a plain Jane when we got it but it ain't plain no more! This gun is sporting full blown "D" coverage scroll. ALL of the screws are engraved. 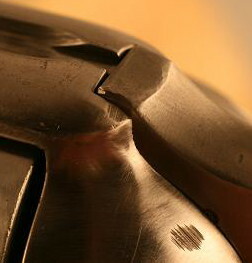 The front sight, hammer, gate, gate seat, and even the ejector rod head has felt the engraver's chisel. 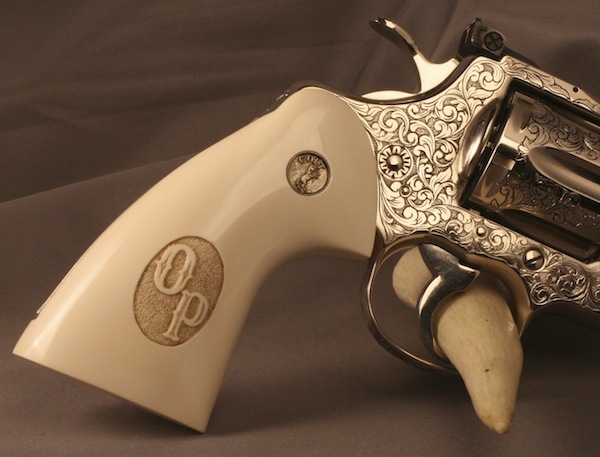 Perfectly matched and fitted one piece pre-ban African elephant ivory with double Texas longhorn scrimshaw. We have to admit...this gun is not for everybody, but for anyone that wants this much coverage, this is the place to come. Our latest engraving project. It's another Bisley. There is not a lot to say. This beautiful Colt speaks for itself. Here is a Python that a client sent in for our work. It was a nice gun when it got here but look at it now! Everybody knows that Pythons have skyrocketed in the last couple of years. You can hardly find an engraved one. Why not call us about doing something to your Python? This Colt is celebrating it's100th birthday this year. Born in Hartford, CT in 1914 we are not sure what use it had over those last hundred years but it was looking pretty tired when it arrived at Nutmeg's doors. We breathed new life into it. We bet it looks better now than it did a century ago...what do you think? One of our clients had this nice 2 1/2" Diamondback. He sent it to us for a few simple changes. 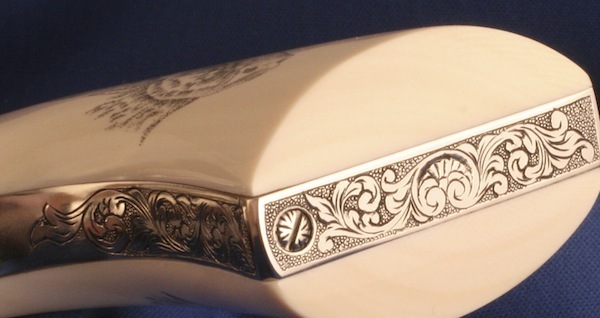 Custom ivory checkered grips with nickel medallions and a generous coverage of Nutmeg scroll. We can do this to any of your Colts. Nutmeg's latest creation. 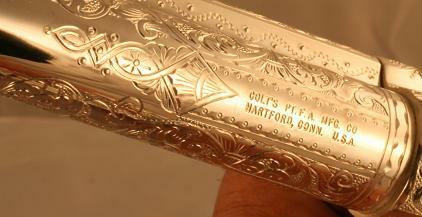 Our client sent this Colt in to us with some very specific requests in terms of engraving style and pattern. We worked with him and we think the results are astonishing. 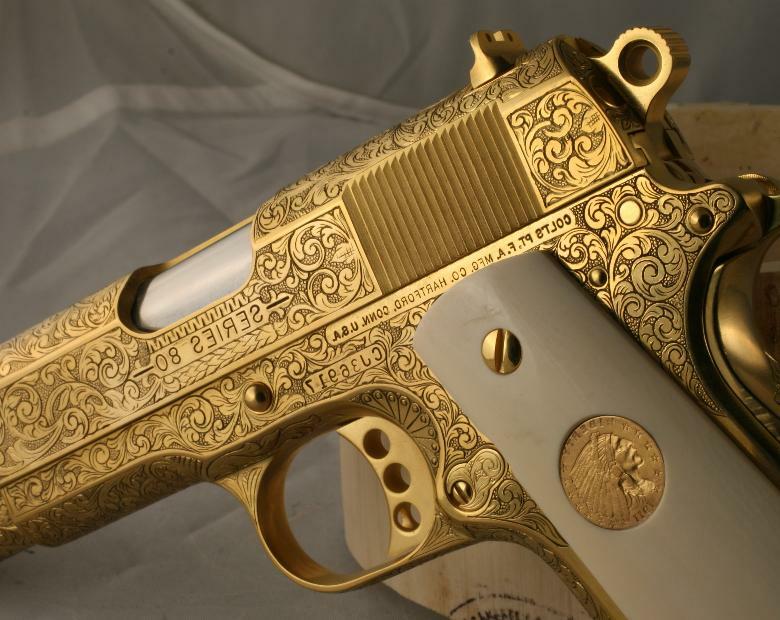 Check out this Colt Bisley. The before pictures kind of confirm that this was a boat anchor. 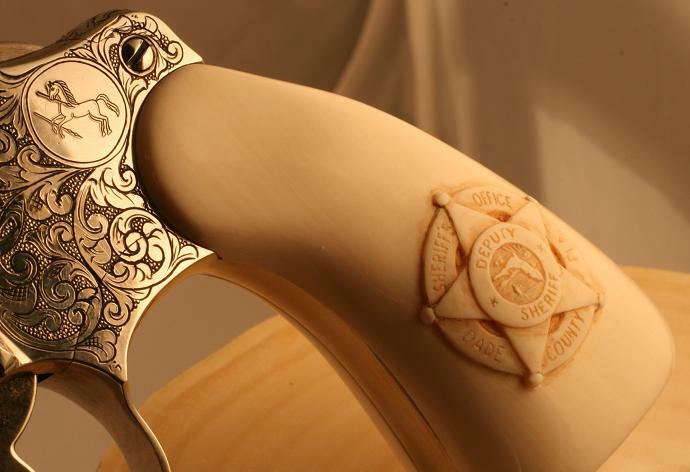 A decorated law enforcement officer from Florida sent us his Python for engraving and ivory grips. We took his plain nickel gun and personalized it for him with the county seal as well as his badge number just behind the hammer. Here are a few pictures of a three gun shipment that a client sent us. These three guns will be Christmas gifts to his wife Cookie, his daughter Lindsey and son Ryan. When we got them they were rough, but look at them now. It's not too late to get a Nutmeg surprise for under your tree. Here is a gun that was pretty beat when we got it. We stripped the old finish, and prepped it for engraving. 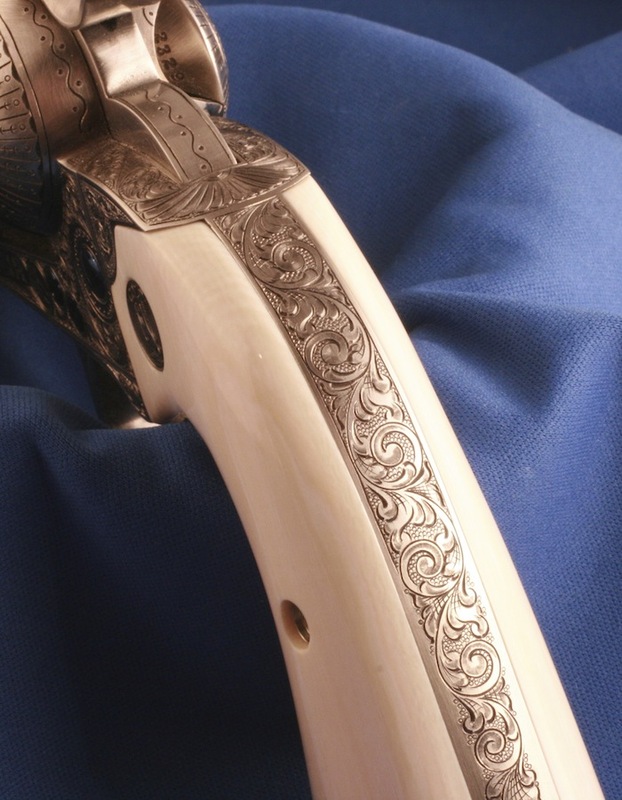 After that we applied our extremely popular antique nickel finish and topped the whole thing off with a terrific pair of ivory grips complete with antique pewter coin medallions. Here are a couple of shots of a Lady Smith. 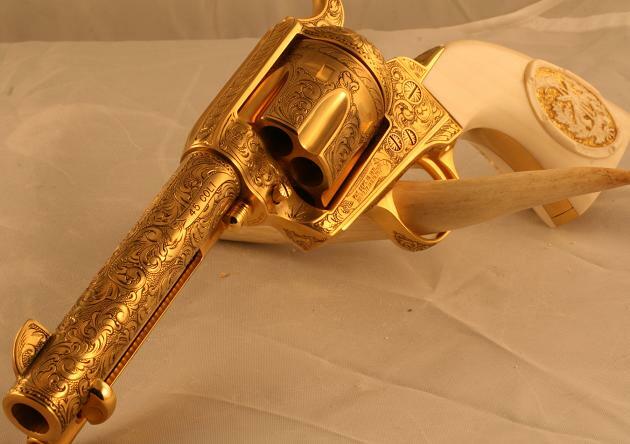 Our client is celebrating an important wedding anniversary and he decided to give his bride this gun as a gift. This man sets an example for us all to follow. 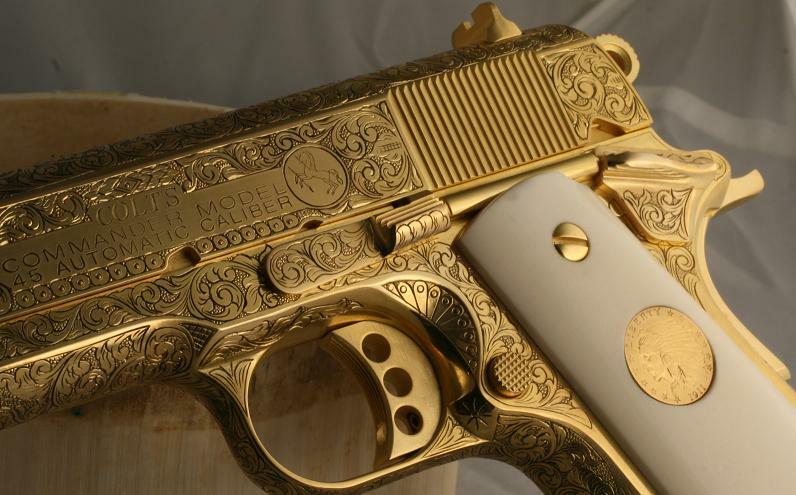 What a way to get a new gun into the collection, and how can she NOT like it!!?? 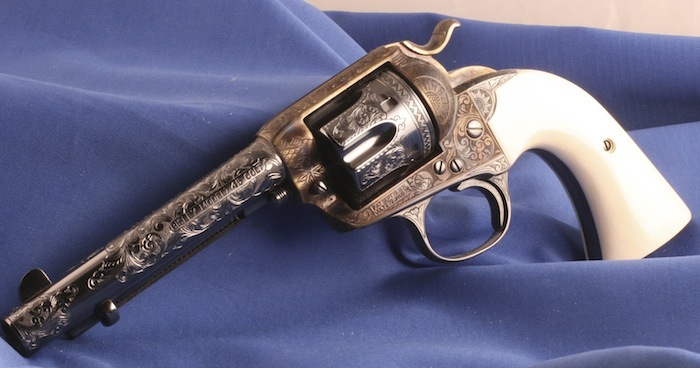 This is an older Colt Diamondback. A very rare caliber, this .22 began life with a 4" barrel but it's owner lusted after an engraved version with a 2 1/2" barrel. Nutmeg Sports to the rescue. His old 4" is now a 2 1/2". It is engraved and is sporting checkered ivory grips with genuine Colt approved solid pure sterling silver rampant Colt medallions. The gun was nice in an earlier life but he thinks it is better now. What the client thinks is of utmost importance to us. 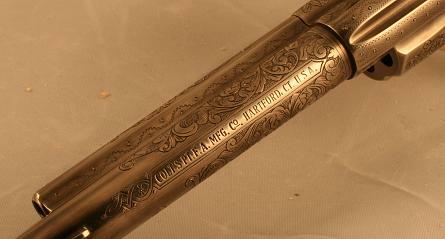 Here is a very early Colt SAA manufactured in 1875. It was a pretty rough gun needing a lot of work. Look at it now. A client sent us this Python. 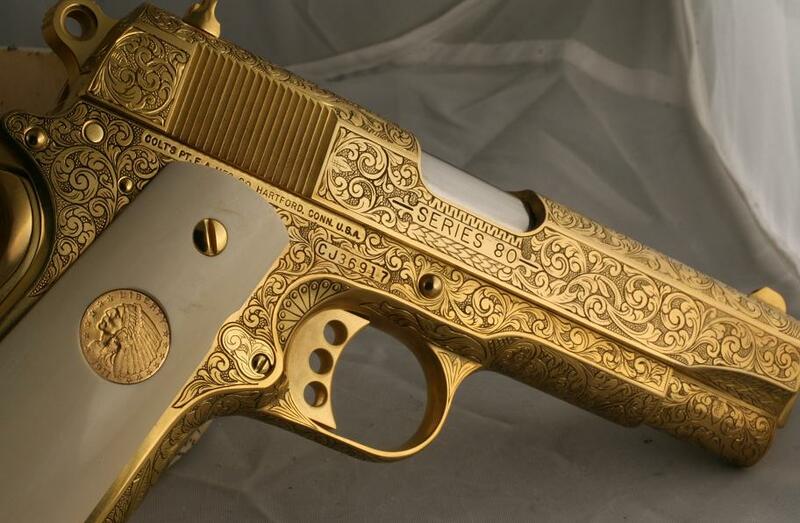 We embellished this Colt with breathtaking master scroll coverage and 24 K gold accents including checkered ivory grips with antique deep dish gold Colt medallions. Here we go again. Another different Colt sent in by a client for rescue. We think we did OK with this rescue. 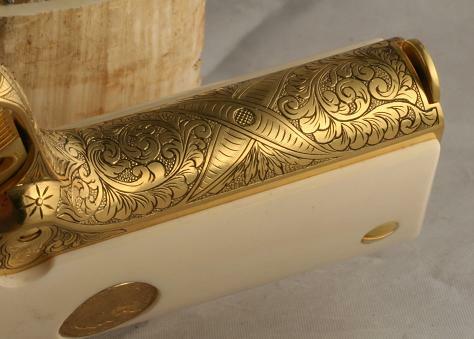 Spectacular 24K flush gold inlaid borders, 3/4's coverage with period scroll, grips that match the original pair except carved from solid pre-ban African elephant ivory. The person that sent it in plans to save it for his son. 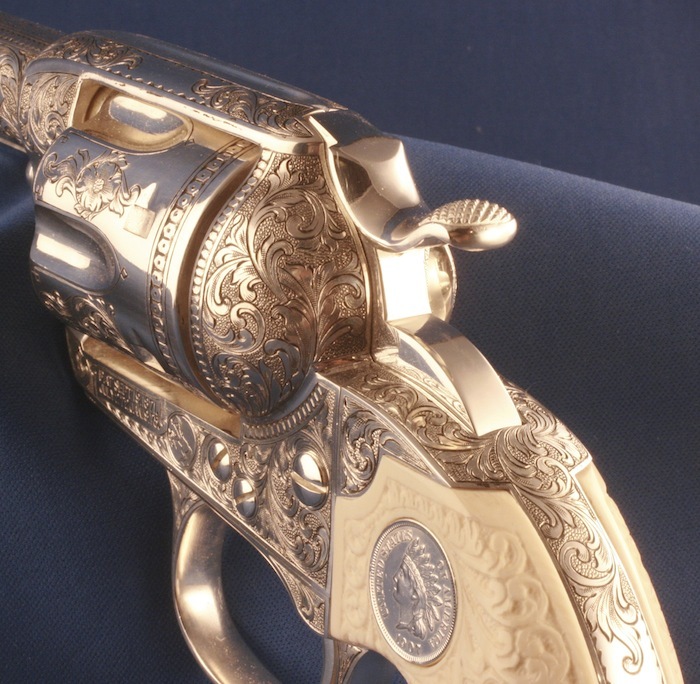 The inspiration for this gun came from a different gun that was the work of Leonard Francolini. 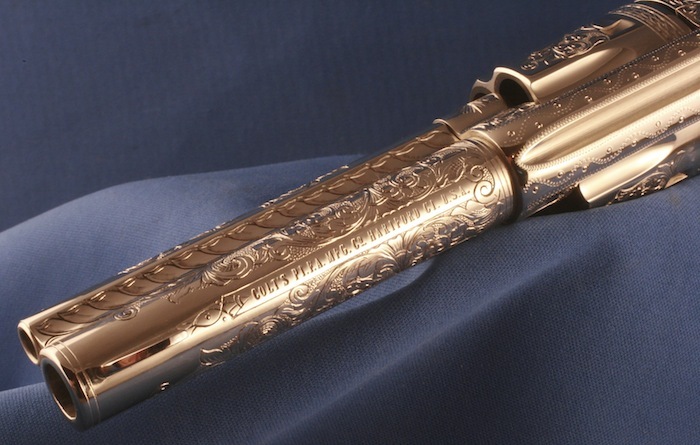 He engraved the original gun known simply as "THE VAMPIRE KILLER" that is currently housed in the NRA National Firearms Museum located in Fairfax, Virginia. 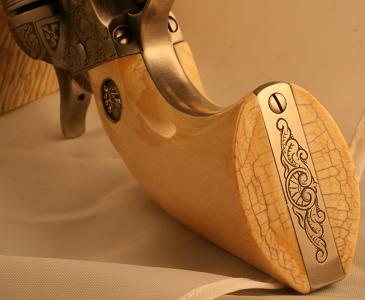 That original gun is so popular that we created a very similar version for one of our clients. The client provided the gun and we took it from there. 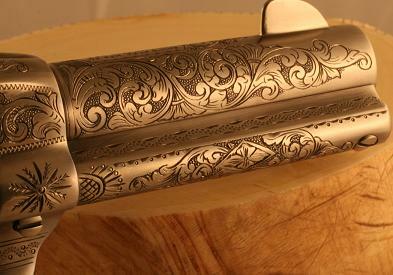 There are quite a few differences from the original work that was done by Francolini but we still think this is a unique gun with an equally unique theme. 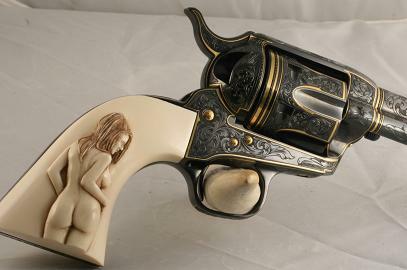 This gun was engraved by Wayne D'Angelo. We hope you enjoy looking at it. 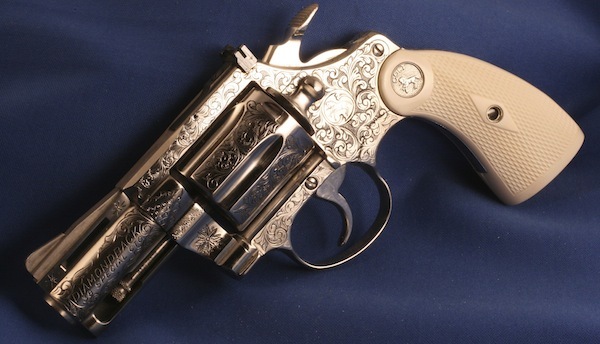 Check out this little Colt 25 semi-auto. Our client loved it. So do we! How about another Colt .380 Gov't Model. 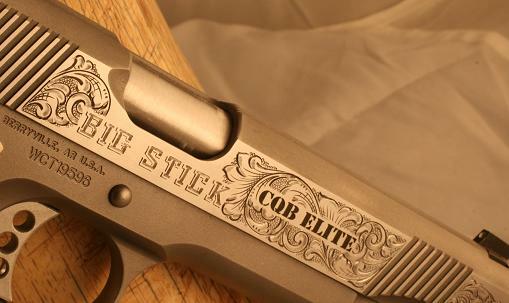 This gun is fast becoming one of the hottest Colt collectables out there. People are snapping them up and sending them to us for further enhancement like the one pictured below. You can't go wrong. 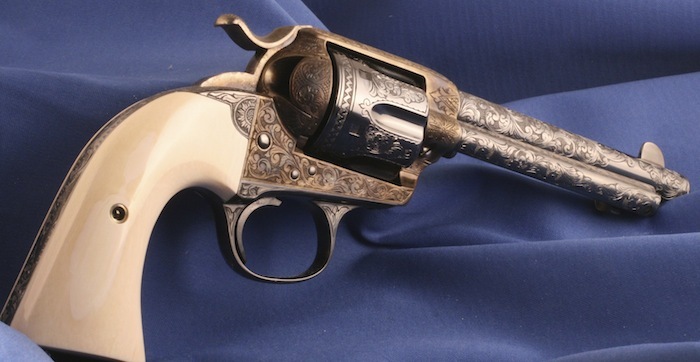 Check out this 1877 Colt Lightning. Our customer sent in this gun for us to perform our magic on. It was in pretty nice condition but now it screams beautiful! 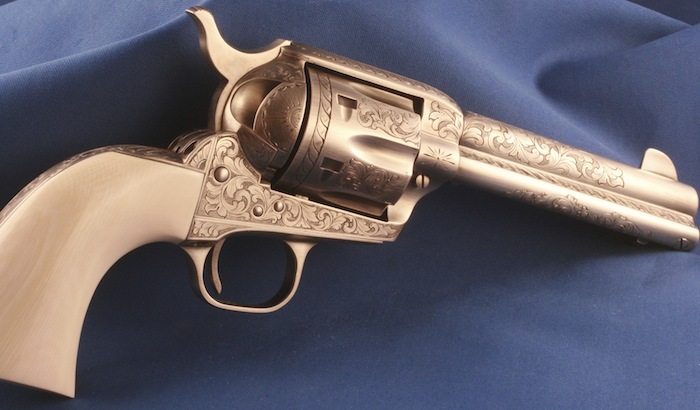 Here is a 3rd generation Colt New Frontier Buntline. The customer was very pleased with the results and so are we. 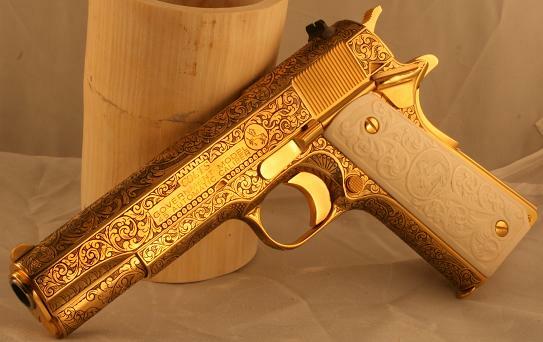 How about this Colt .380 government model? The before pictures tell you that it was kind of a 'beater'. We took that beater and transformed it into a real special carry gun for the owner of the company named in the inset grip logo. 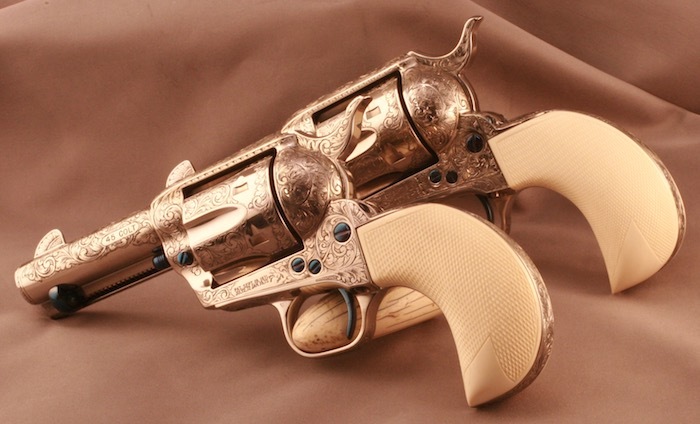 Check out this pair of detective special revolvers. These guns belonged to a client and he wanted his daughters to each have one. They both had the same initials so he had us engrave them and add the first letter of the last name in solid 24K flush gold with the year of the birth of each girl under the "M". The girls loved them and now they will always have a family heirloom from their Dad. It almost seems like we are putting up a new gun every day! Every time we turn around a client is sending us his gun for a Nutmeg project. 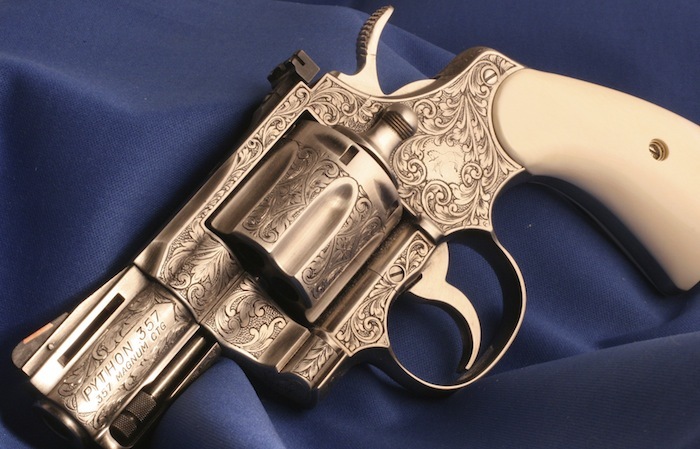 This particular Colt was custom ordered and it is now complete. 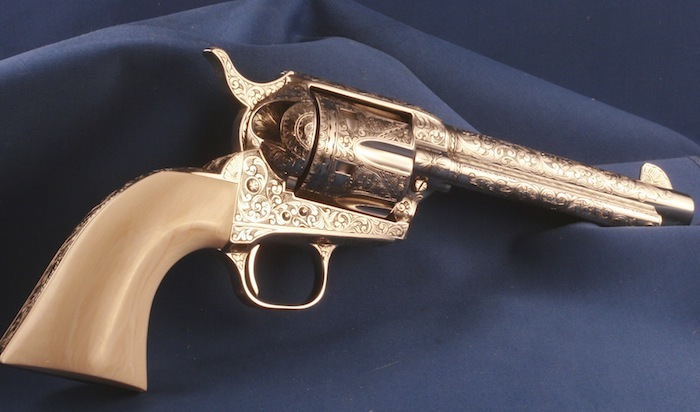 A brand new Colt SAA with a 3 1/2" barrel and a bird's head grip frame. 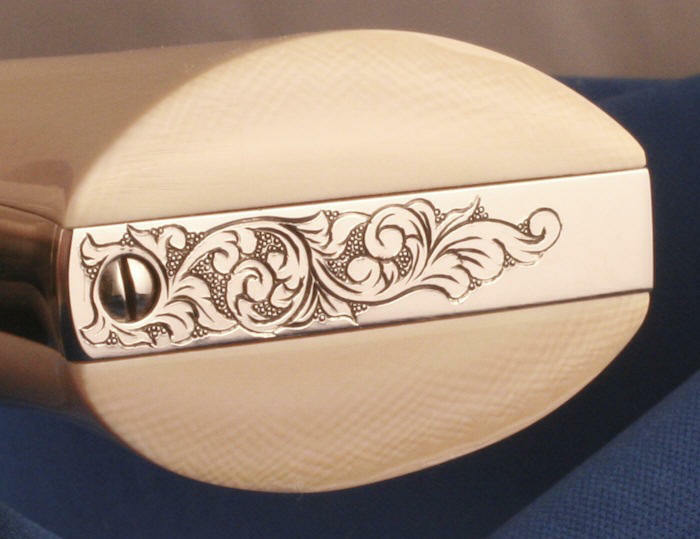 We added the Nutmeg touches like C++ engraving, ivory grips with an inked and baked bright nickel finish. Check it out! Another brand new Colt .380. This time it is one of the newly re-introduced Mustang Pocketlites. 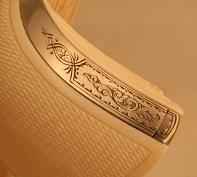 We fully engraved the flats of the slide, the thumb safety, and the slide stop. We inked and baked it and added half checkered ivory. We like it. Another Nutmeg transformation. 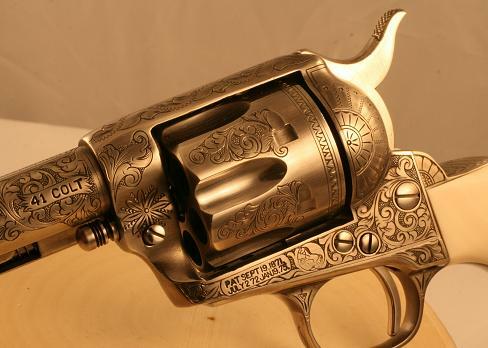 This Colt was a garden variety Sheriffs model. 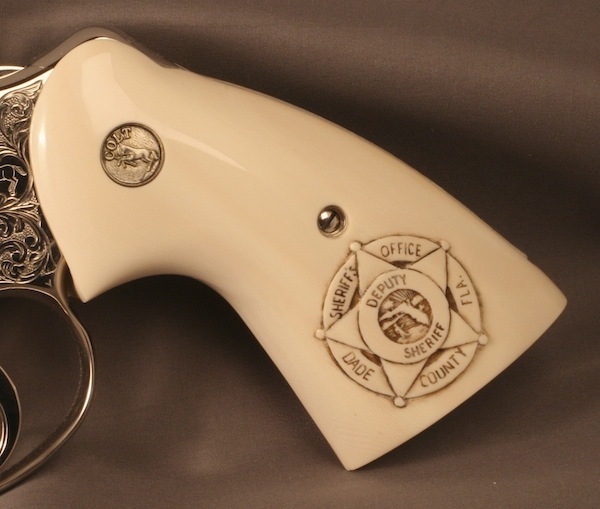 It still is a Sheriffs model but it is now a rare Sheriffs model with 1 piece ivory grips and a bird's head configured backstrap! The original backstrap is with the gun so the owner can swap it around as he wishes....maybe the standard grip frame in his holster for church on Sunday, and the bird's head ivory configuration tucked into his belt as a belly gun at that Saturday night poker game. Either way, it was a great Colt that is now a better more valuable and rare Colt. Our latest example is from a local client. This Colt .380 Mustang was picked up on 1-17-12. It was delivered today on 2-14-12. When we got this gun it had the standard black plastic grips and it was not engraved and was blue. It was a carry gun and had been carried for quite some time. The blue was worn off in spots and there were a lot of small dings and nicks. It is now exactly 4 weeks later. 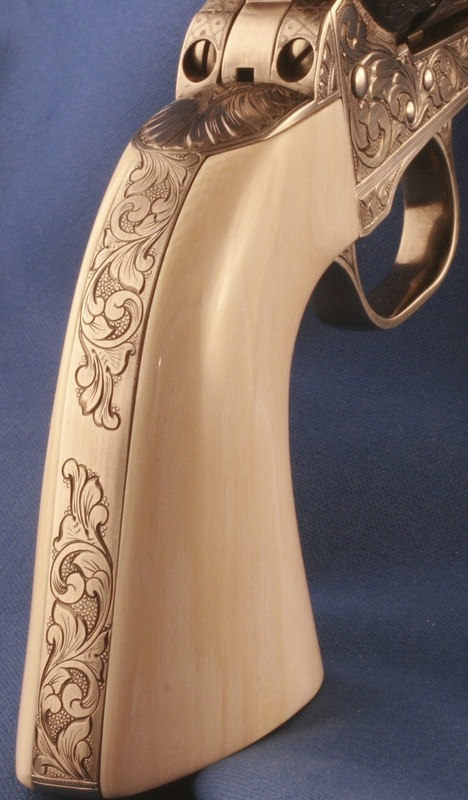 The blue finish is gone, it has been wonderfully engraved, and fitted with bark ivory grips. What a transformation!!! We are proud of it and our client is as well. 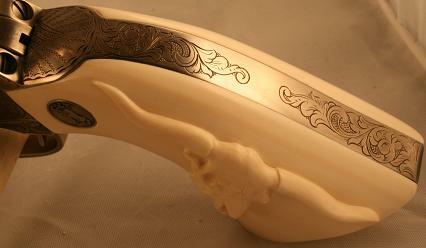 Just a month or so ago, a client sent us this .380 for carved ivory and engraving. There is not one engraveable surface that has not felt the artists chisel. 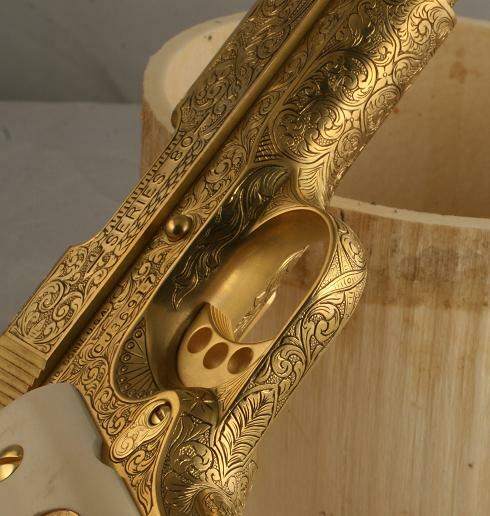 Just spectacular...and check out the carved ivory grips with 24K gold leaf accents. Any crook should be proud to get shot by this gun! This Colt was custom ordered from us by a repeat client. 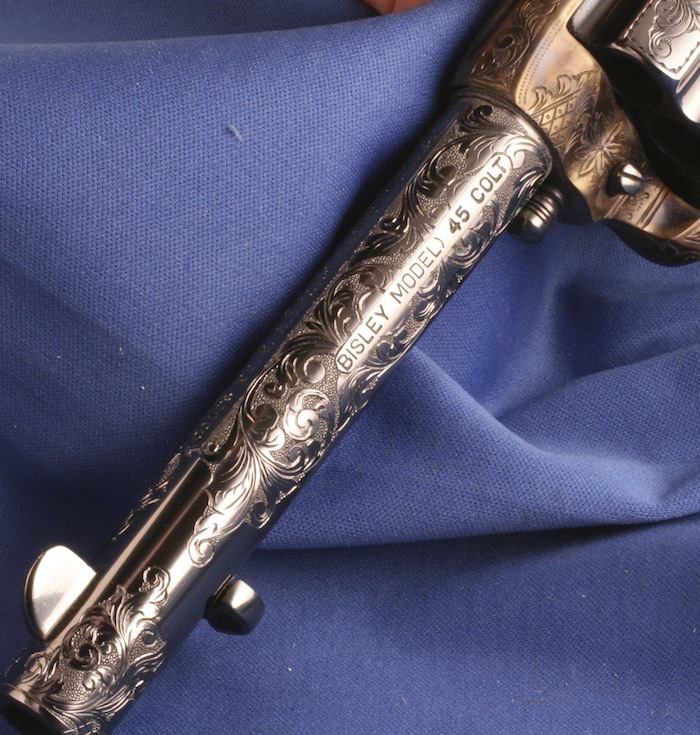 It has that old original carbona blue with color cased frame and hammer, aged looking matched ivory, and about a "C" level of engraving, and a custom tuned action. A real nice gun to add to any collection. Here is another new Colt sent in by a client. It's a 2nd generation .45 7 1/2". 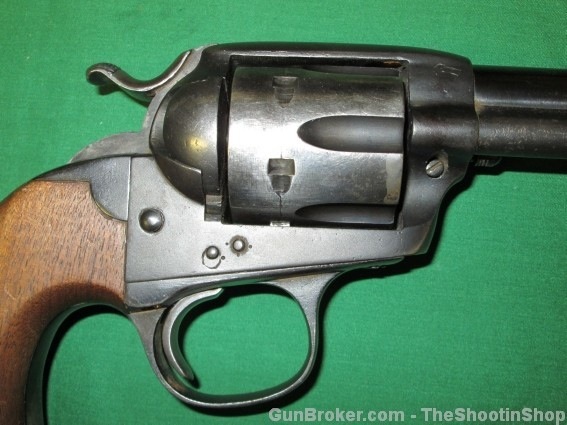 This person is a Texas Lawman that just was tired of the look of his plain Jane Colt. He wanted to dress it up. We think he sent it to the right place. Check out the results. 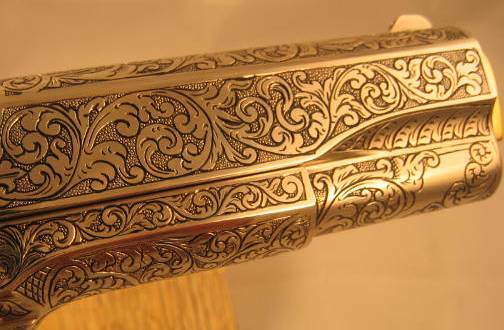 What is happening here at Nutmeg is that more and more clients are realizing that they simply cannot find good engraved guns for sale on any of the big sites. So they are digging out the plain Colts that they own, and sending them to us or are ordering directly from us. On the web all you see is junk or guns that are overpriced by a mile and that do not have all the features you'd like to see. That is not the case here. You tell us what you want and we do it. Most people know it is a good investment in these tough times but the good stuff just isn't out there. Here are a few pictures of one gun that is part of a pair of Colt SAA's that a returning client asked for. He selected the pattern. He chose the antique nickel finish as well. The results speak for themselves. Most of us know of John Taffin. He is a contributing editor to many gun publications and has been entertaining us by writing some of the finest articles regarding firearms for nearly the last fifty years. He has written almost two thousand such pieces and completed five books. Here at Nutmeg Sports, LLC we were very proud when Mr. Taffin sent us an old Bisley of his for us to perform our magic. 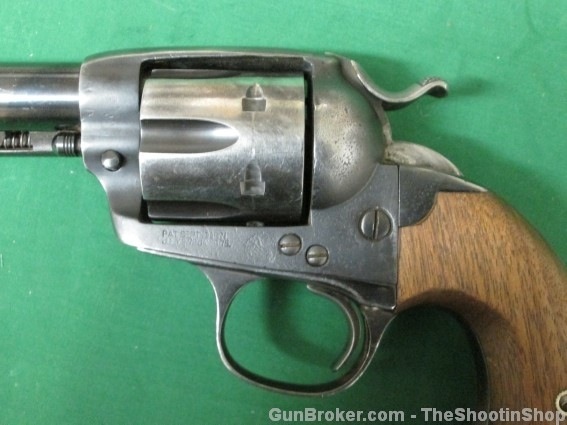 Mechanically it was pretty sound but cosmetically it was what is commonly referred to as a 'beater' There was no finish left on the gun and it was heavily pitted with very light serial numbers and lettering. John gave us complete artistic license. Check out the results pictured below. (click on images to see an enlarged view! 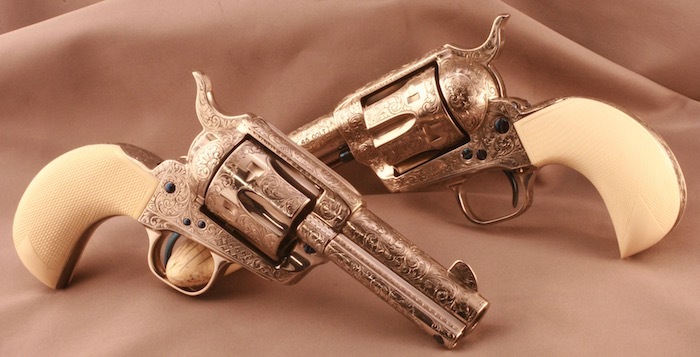 This pair of fine Colts began life as a Centennial Commemorative set offered by the Colt Custom Shop in 1973. Our client decided to convert them into something a little more special. 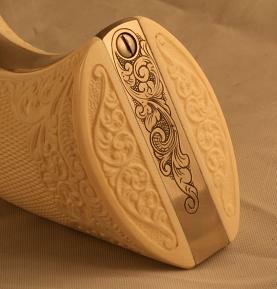 These Colts presented the perfect canvas for the craftsman to apply some spectacular engraving. We finished the job with great ivory grips, a nickel finish on one and color case and blue on the other. This is a first gen Colt SAA that really needed help. The numbers and rollmarks were not crisp so we had work to do there. 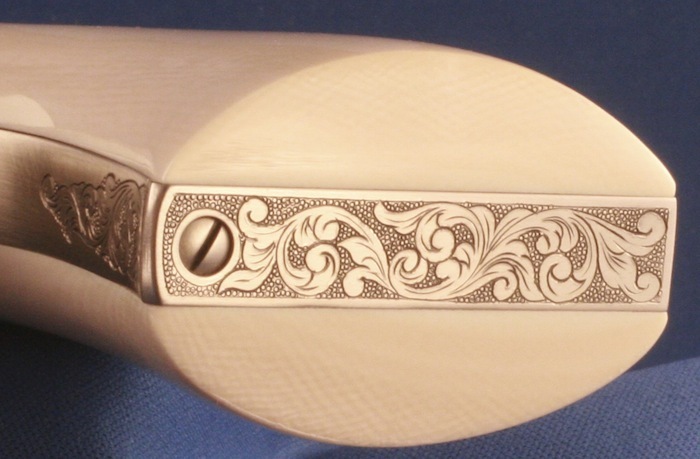 We added the engraving, the ivory grips, and that fabulous sterling silver finish. We think you'll agree that it looks pretty nice. Here is a brand new Colt SAA that a customer owned and wanted to dress up a little. With just 6 weeks lead time and not a lot of money, we added the carved ivory, the engraving, the antique nickel finish, and a whispery custom tuned action. We like it a lot. Hope you do too. 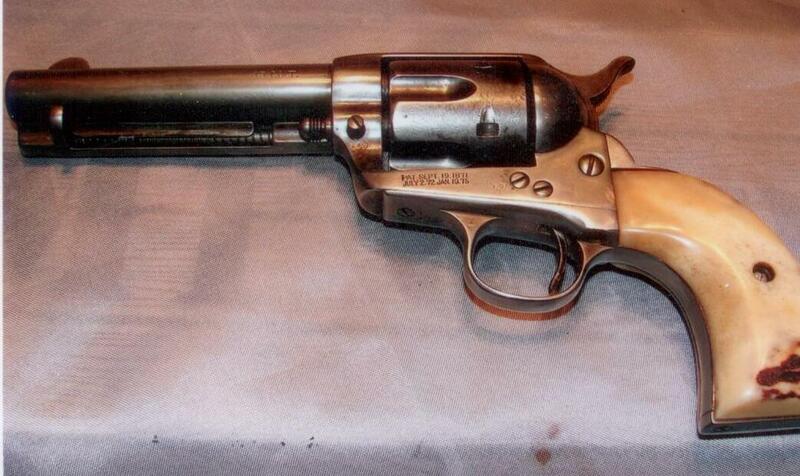 Here is a real nice little S&W revolver. Our customer just wanted to dress it up a bit. What better way to do it quickly and affordably than to have us put some high quality scroll and a pair of ivory grips on it. The value of what was just a plane Jane has increased dramatically for this gun's owner and his children. Check it out. This new example was the brain child of our client. He had the idea of labeling a new pair of .357 magnum Colts with a numbered spade design in the shovel handle area. The resulting affect looks great. 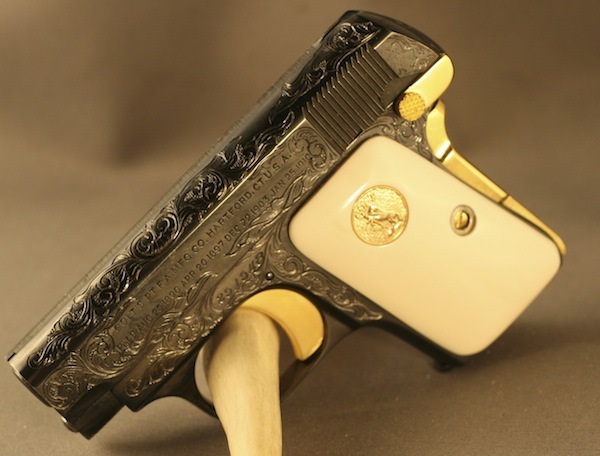 He is a serious competetive action shooter so in addition to the engraving, he had us do a super slick action job to each of these consecutively serialized guns. We think this pair is easy on the eyes too. This "example" section is really gaining in popularity. More and more folks are seeing what their guns can become fairly quickly (a couple of months). This pair of 38-40's had seen better days and the owner wanted to give them a facelift. After just two months, you are seeing the results. 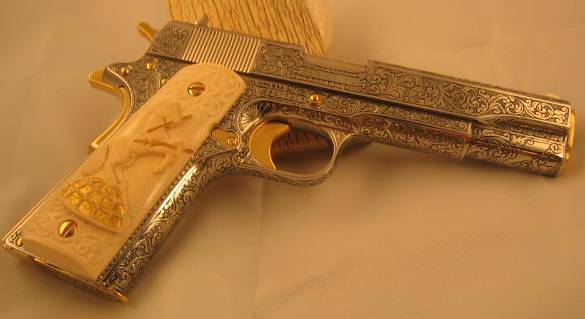 Book matched engraving, signed by the Colt contract engraver, antique finish, first generation metal work, book matched ivory, genuine antique Colt medallions. The owner was kind enough to give us permission to show them here for everyone to see. Your guns can have the same transformation Give us a call to discuss it. This was a garden veriety Colt SAA. It's owner did not want to buy another gun, so he sent us this one. We changed it into something very special. We like it, he likes it and we hope you like it as well. 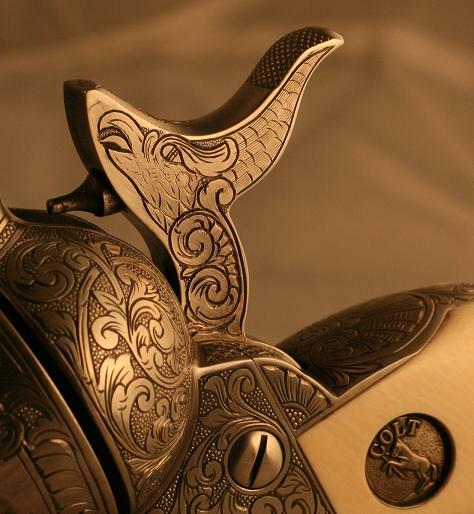 As long as we are engraving a gun, we love converting a conventional backstrap into a birdshead. This 1st generation Colt was kind of a beater. You can a look at the before pictures and see the transformation that has taken place. 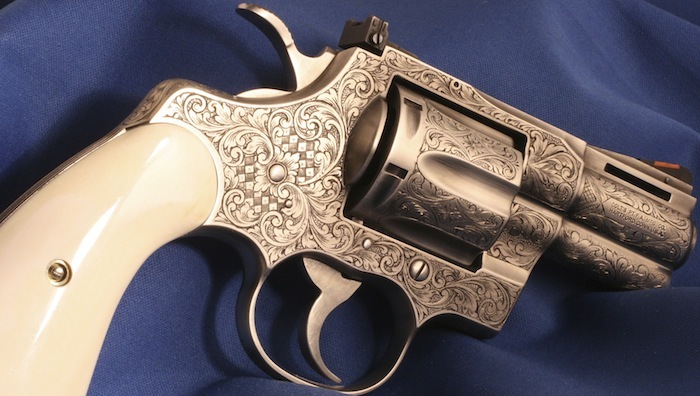 This important Colt was the brainchild of one of our very sophisticated collector clients. We enjoy working hand in hand with our customers to help them create heirlooms of intrinsic value. This is a fine example of such a creation. Our client sent in this Colt Combat Commander. A nice gun but not anything he'd want to wear on Sunday. Now it fits in with his finest garb. Here is another brand new Colt from Nutmeg. This is not just another garden variety gun. It is a collaboration between the Michelangelo of Modern Engraving, Leonard Francolini and master engraver Wayne D'Angelo. A very elaborate creation and the crown jewel of even the finest collections. Here is our latest rescue gun. We have included before and after pictures. This gun was actually a third gen. but in very rough shape. We ended up adding a barrel, a cylinder and ejector rod head, screws, and a hammer. 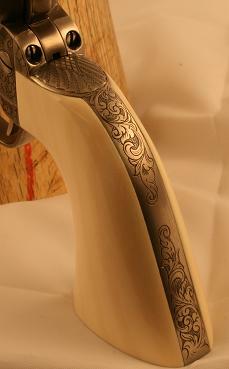 Not to mention the engraving, ivory grips and antique nickel finish. We like it...what about you? 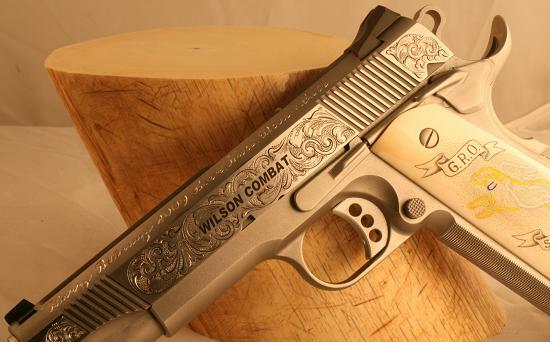 Here is a Wilson Arms .45 Cal semi-auto. The family of the client purchased the gun. Wilson shipped it to me. Communication took place between the client's family and me. Art work and photography was sent. You are looking at the results. The family was thrilled, the recipient was thrilled and we are very proud of the results. This Colt came in just recently and we are very proud of the results. 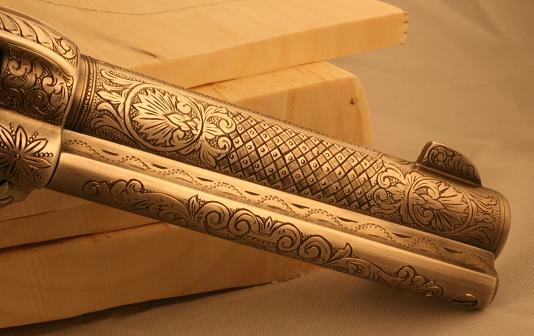 The grips are very special one piece ivory in a carved, checkered and scroll engraved pattern that is even visible at the bottom of the panels. 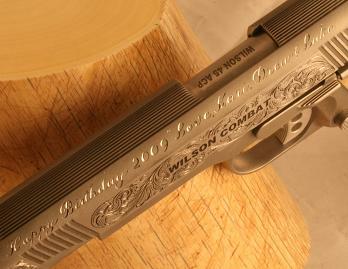 This old Colt was sent to us by the client with a picture of the engraving he wanted. The gun itself had no finish remaining. A few of the markings had to be sharpened up. The grips were old and beautifully aged but poorly fitted. 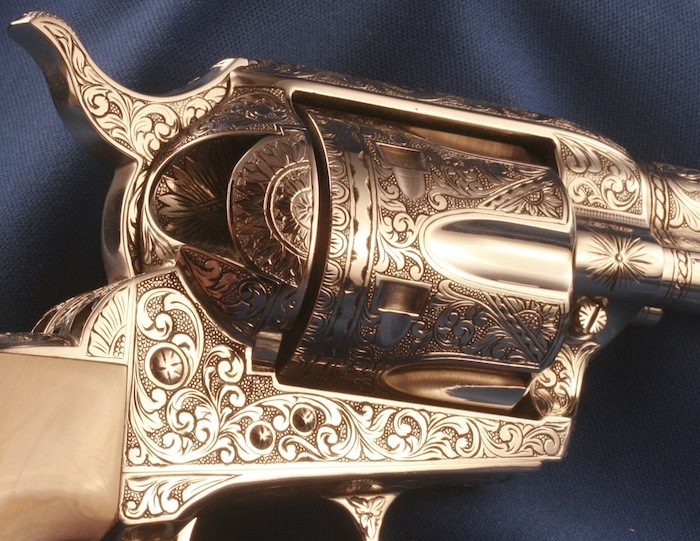 We brought this Colt back and made it better than ever with our fabulous antique nickel. This wonderful Colt looks like it could just speak volumes about the cowboy days of old. 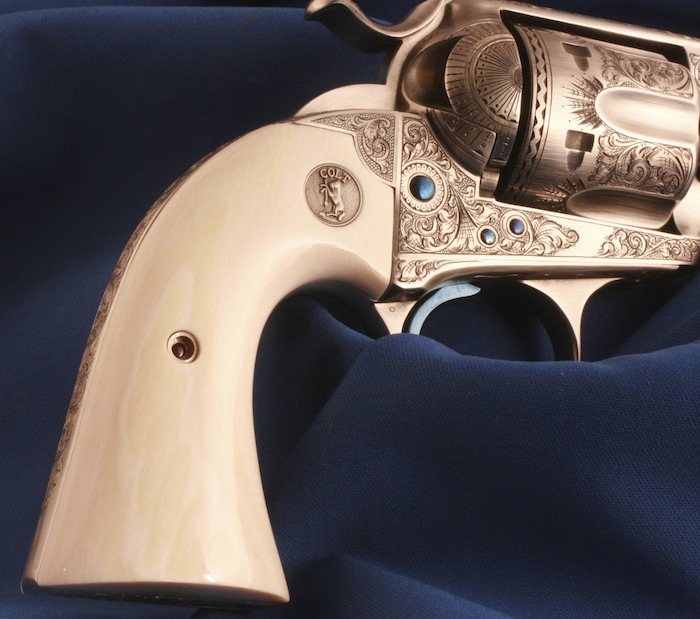 The production of this one-of-a-kind .45cal 4 3/4" Colt SAA and its custom case involved seven different craftsmen in five states to complete. 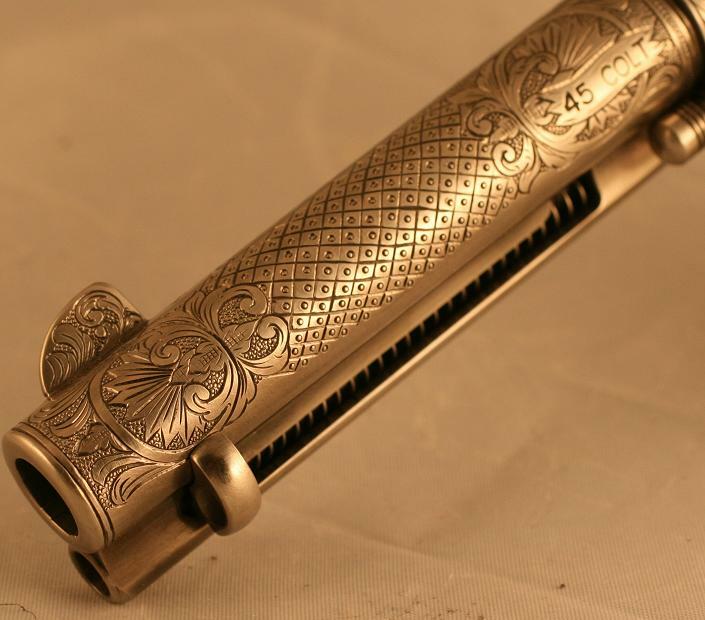 A second .45ACP cylinder was numbered to the gun and engraved in a complimentary pattern. 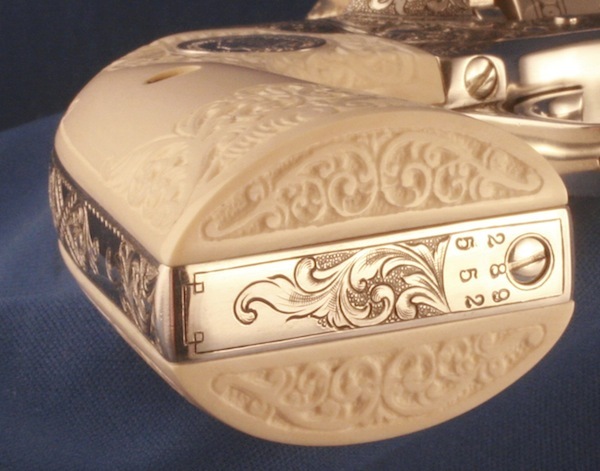 In addition to its sterling silver finish, this masterpiece is highlighted by custom-fitted one-piece pre-ban African Ivory Grips with a detailed relief carving of the 2009 West Point Class Crest on the left panel and it's owner's initials scrimshawed in the right panel. This is an unusual gun. 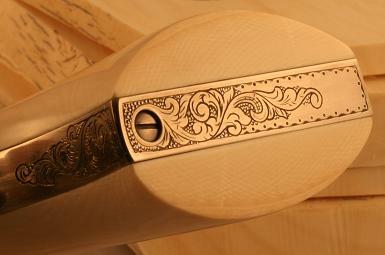 The client sent it to me quite some time ago for the grip carving and checkering. We did the work and then just recently he returned the gun for engraving and antiquing. 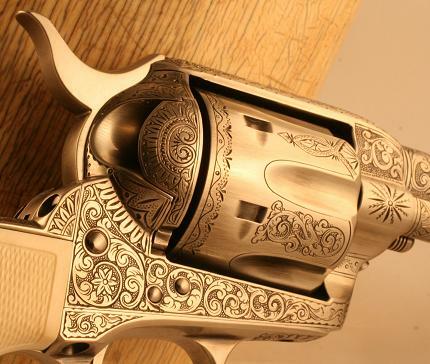 It is one of the nicest guns we ever done. Here is a unique 1911 semi-auto .45. This client had a favorite country and western song titled "The Devil's Right Hand" that he wanted incorporated into a gun. Owner of a rare coin shop, he wears his guns while at work, and he tells me this Colt will be no exception. A very interesting Colt ordered exactly as you see it by a very discriminating client. Check out those grips! 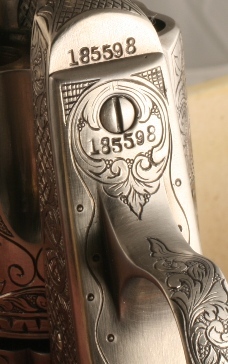 The serial number of this Colt is the client's first name followed by the numeral 1. This is a brand new Colt that the customer ordered from us....specifically to his specifications. 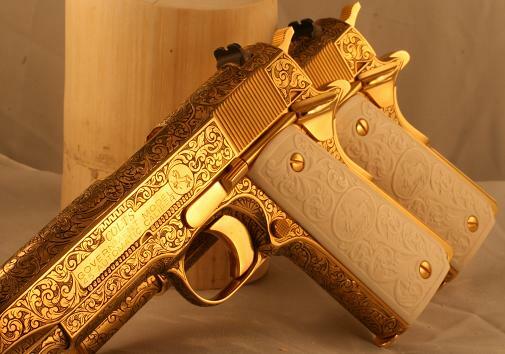 This is a pair of series 80 1911's. 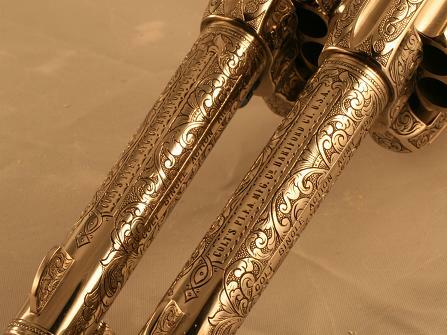 They are exactly as the client ordered them....24K gold plated, with high relief carved ivory grips and consecutively serialized. Check out this pair. Three months ago they were a tired drab looking pair of color cased and blue SAA's. 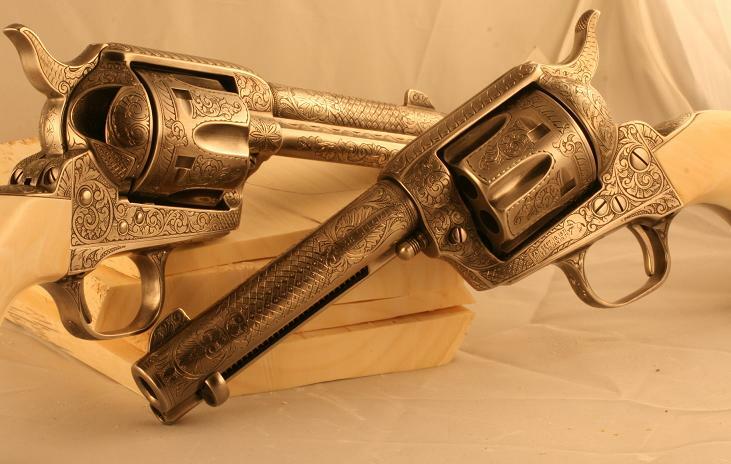 The black powder style frames, ideal caliber and barrel length gave us the foundation on which to make this pair of Colts what you see now. We just completed this project for a very satisfied client. He sent us his tired gun for a little face lift. This is the result. 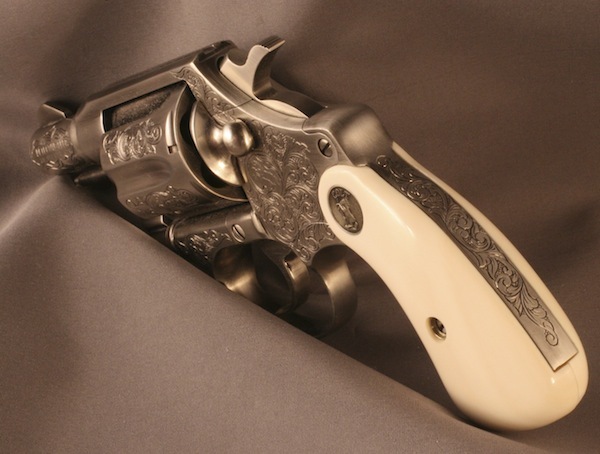 Spectacular "B" engraving, a custom tuned action, ivory grips like you dream about with antique Colt medallions, and a Colt that is every bit as new as the day it left the factory....only better! This is our latest posting of a new Nutmeg pair. Our client sent us his pair of Colt .38 specials. They were color case and blue plain Janes. Nice guns...composite grips...but nothing to brag about. We transformed them into what you see here, and for not a lot of money. 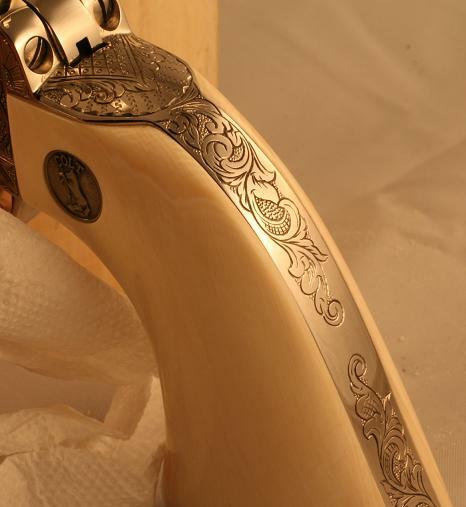 Silky smooth action jobs, ivory grips, classy engraving, antique nickel finish! Now these guns are something very special to him...his son...his grandsons. 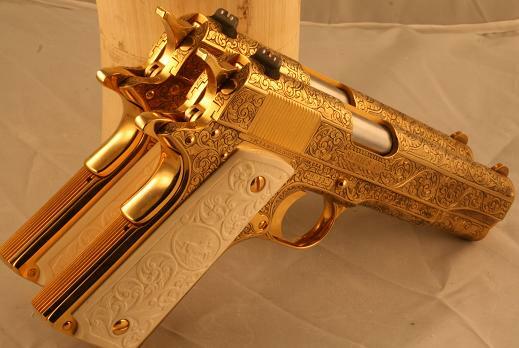 We can do this to your guns. 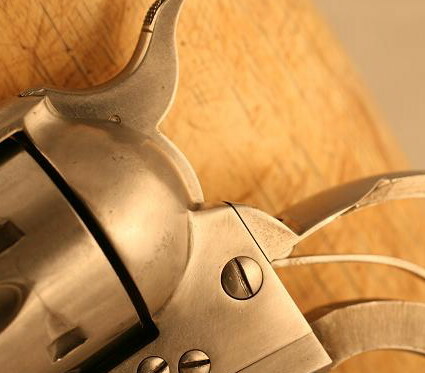 A recently retired law enforcement officer sent us his service revolver. 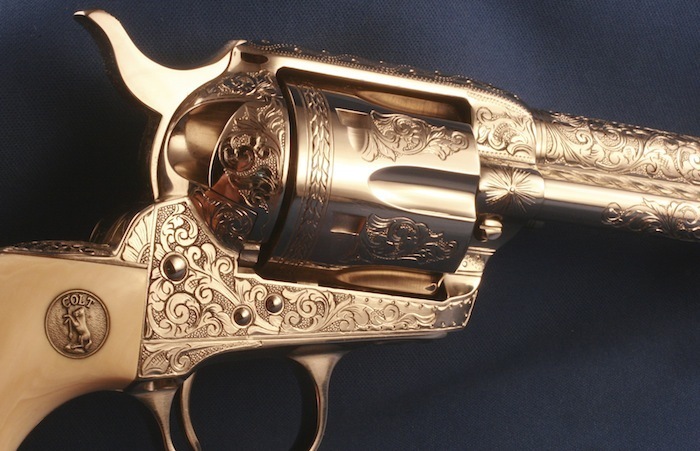 Most collectors realize the significance of law enforcement guns. 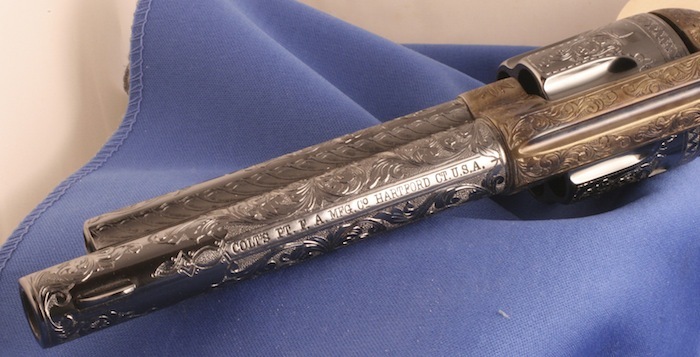 Imagine the importance of memorializing a gun that had seen service through an entire career. What better way to honor a Dad or any loved one while at the same time creating an extremely valuable heirloom. 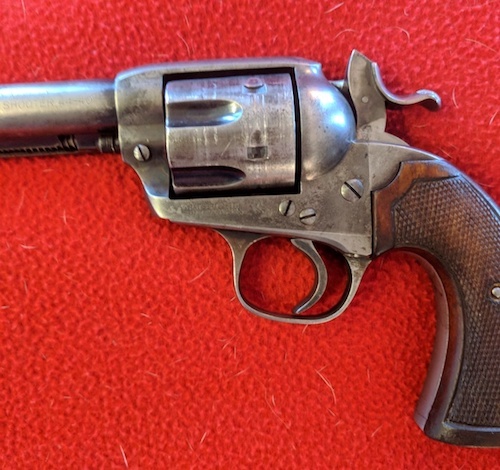 This old Colt was sent in by a customer and he would agree it was a "RAT". It was refinished to death...no markings...all worn down...no grips. A real boat anchor. Then we performed our magic. Now check it out! A client sent in this Colt SAA. It was a very plain used SAA with hard rubber grips. Check it out now. This gun was a brand new Colt semi- auto but in the white. We improved its appearance a little.